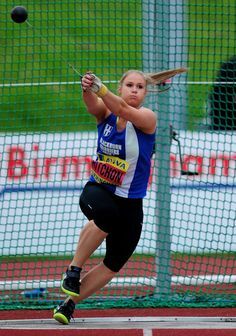 Sophie Hitchon opened her season with a cracking performance in the IAAF Meeting in Kawasaki, Japan at the weekend to take 2nd place with a throw of 73.97m – just 16cms behind the winner (Gwen Berry from the USA) and just half a metre off the throw that won her an Olympic Bronze Medal in Rio 2016. Sophie stands at the top of the National Rankings and lays in 4th position in the World Rankings………….Sophie’s World Rankings Profile. 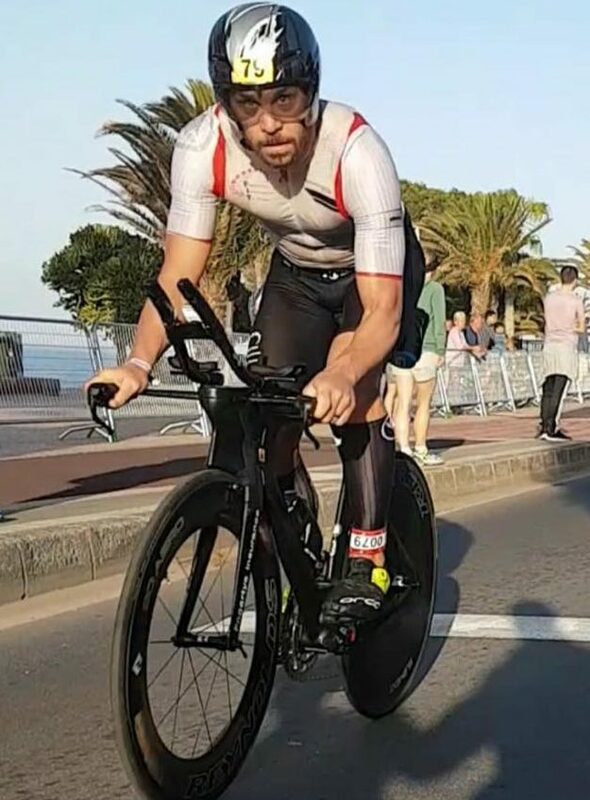 A superb performance from Brian Fogarty at the Lanzarote Ironman at the weekend where he finished 11th overall – 1st British athlete – 1st Amateur in a combined time of 9hrs.22.57. Brian’s splits were 61.47 for the Swim – 4hrs 58.03 for the Bike – 3.15.18 for the Marathon. One of Brian’s great strengths is the Bike and the power he generates. 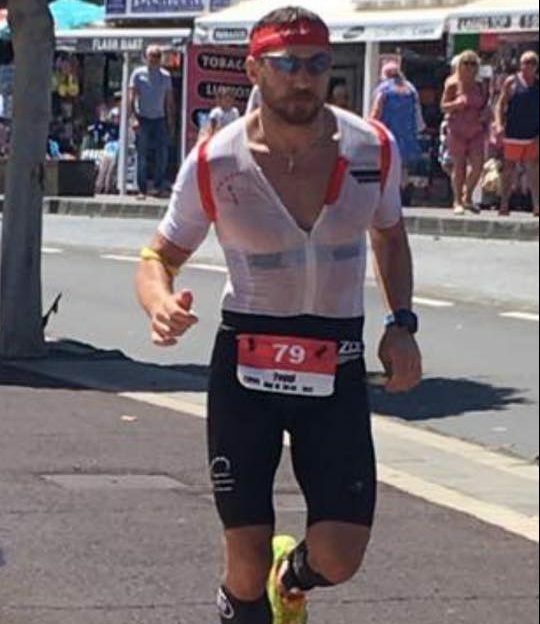 Finishing 11th overall in the Race, on the Bike Leg his time of 4hrs 58.03 was faster than the athletes who finished in 2nd; 4th; 6th; 7th; 8th; 9th and 10th – only the winner and two others posted a faster time. 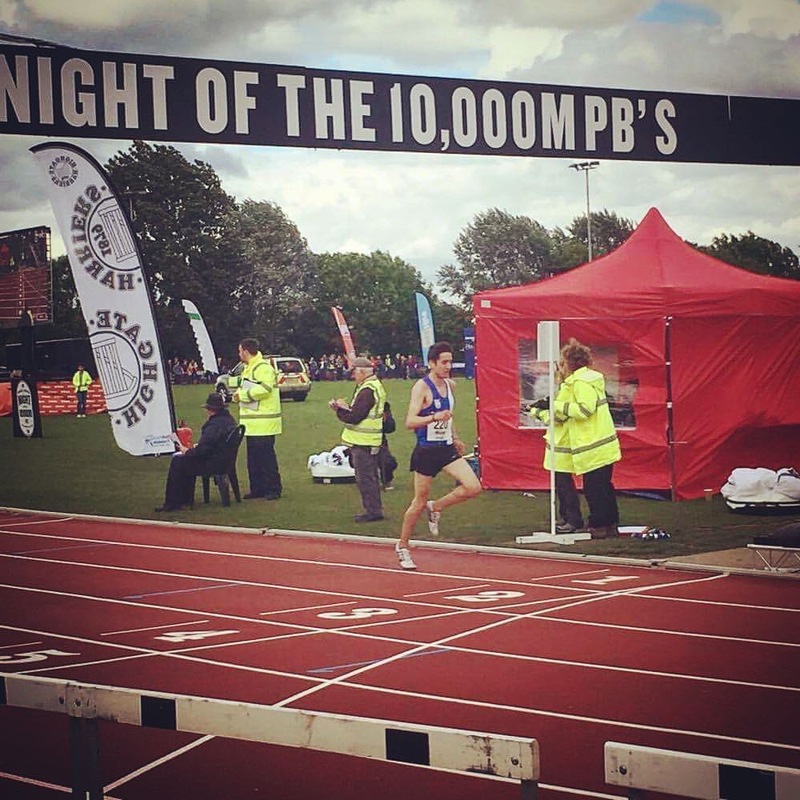 Rob Warner has been training for this night and it paid off handsomely for him with a big Track 10000m personal best. 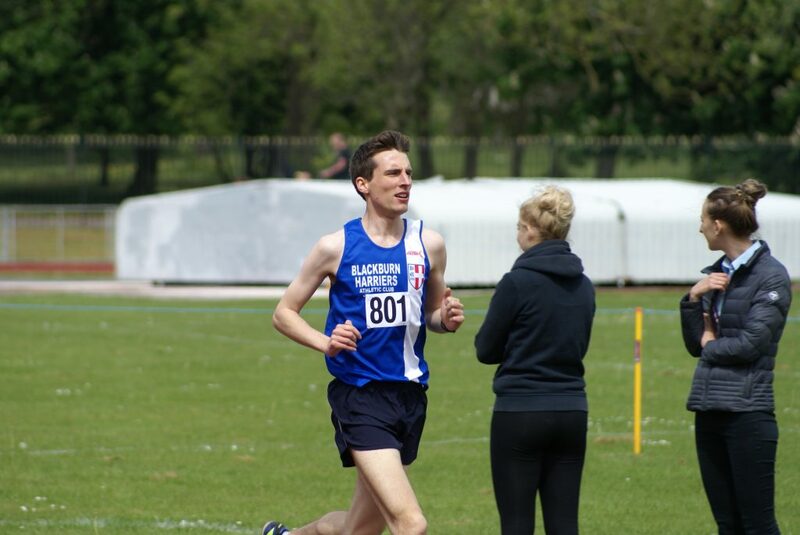 He last ran the distance on the Track at the 2015 Bucs posting a time of 33.17 and in 2016 he reduced his Road 10k time down to 31.00. At the Race last night in Highgate – which included the British Championships – Rob knocked two and half minutes off his previous Track 10000m time to set a new personal best of 30.46 in finishing 2nd in Race C.
Great running by the Lancashire Team in the Inter-Counties Fell Championships at Broughton heights last week which saw the Men take Team Gold led home by Chris Arthur and the Women led home by Nichola Jackson just outside the Medals in 4th place. 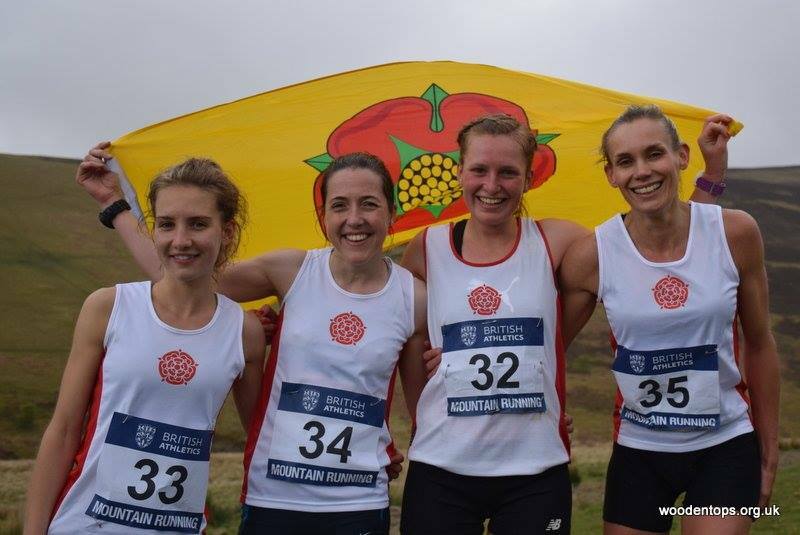 Blackburn Harrier Victoria Mousley ran for the Women’s Team and unfortunately due to an injury, Liz Greenwood had to withdraw after being selected. After the Race Victoria spoke to the Club and told us that “Lizzie was Injured and wasn’t allowed to run she was very much missed. Really tough course! 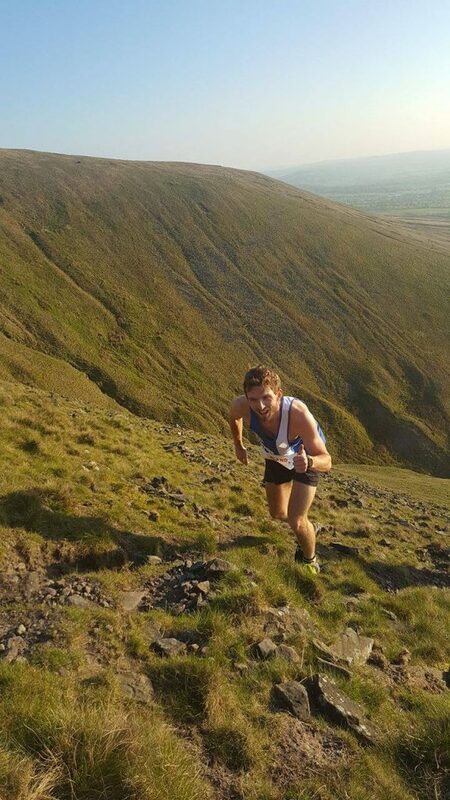 Super hilly, strong winds but a fantastic event”. Three hundred and seventy one finishers at this years Race with three Blackburn Harriers among the runners. Classified as an AM event, the Fairfield Horseshoe starts and ends at Rydall Hall (grid reference GR367063) near Ambleside. 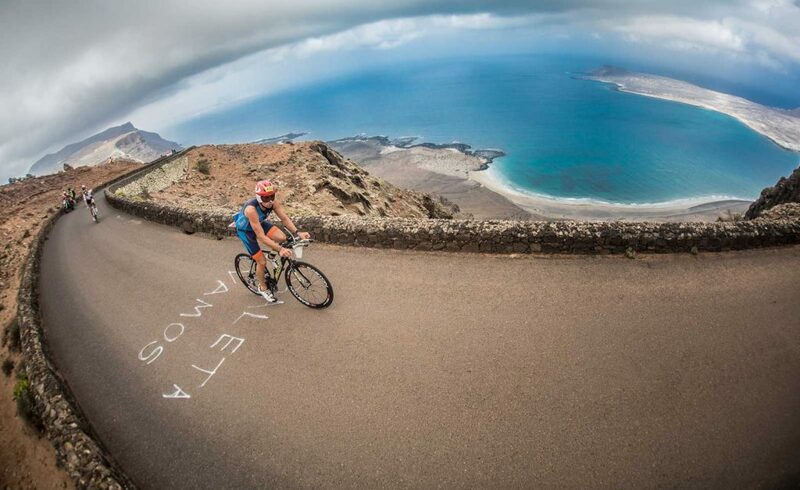 The 9 mile (14.5Km) route incorporates 2999ft (914m) of climbing. This years Race was won by Ben Abdelnoor in a time of 1hr 22. 36. First home for the Harriers came John Horrocks in 47th spot with a time of 1hr 42. 27 followed just a couple of minutes behind by by V40 Tom Cubbon in 63rd spot with a time of 1hr 44.43 and Andy Heys (128th) with a time of 1hr 52.44. 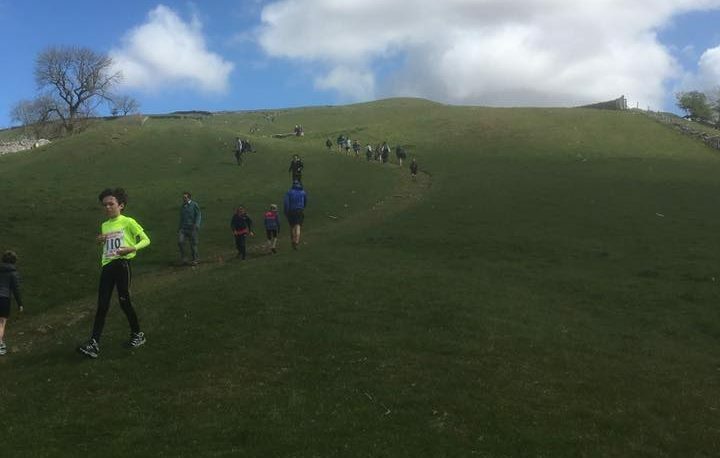 This Race is described on its Website as ‘A demanding 22 mile route, with 3011ft of ascent, takes in landmarks such as Pikedaw, Gordale Scar and Malham Tarn; and a gentler 9 miles, which includes The Pennine Way and Janet’s Foss – voted one of the Top 10 Secret Trails of The National Trust’. 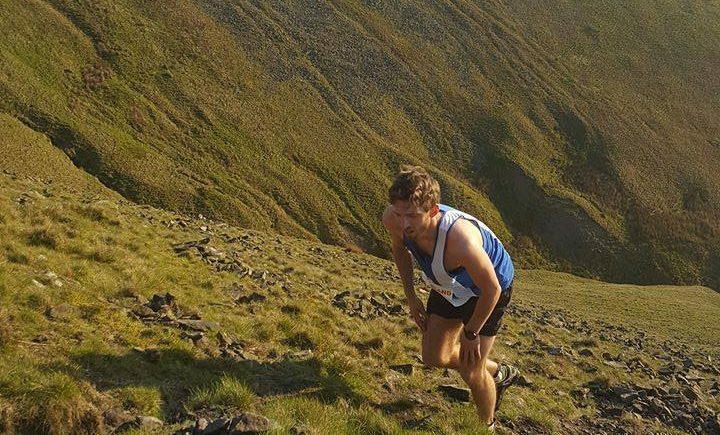 It was the ‘gentler 9 miles’ that Blackburn Harrier John Orrell decided to do and he had a good run coming home in 15th spot with a time of 90.29 out of a field of 108 runners. 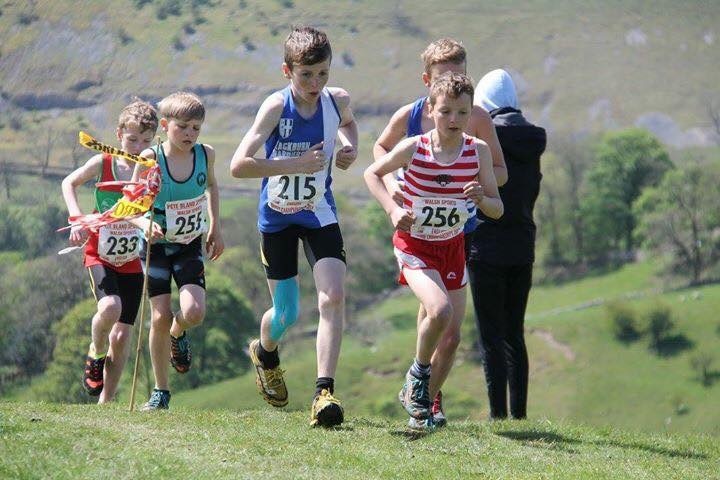 This was a tough Race for the Juniors as Chris Thompson, father of Dexta, Kady and Felix told the Club afterwards…….“Our kids ran in the 5th junior FRA race of the series over at Great Whernside at Kettlewell today. A very tough uphill only race being one of the hardest races they have ever done especially for Felix, they had to run all the way up then walk back down to the start, making it very hard for us to watch”. 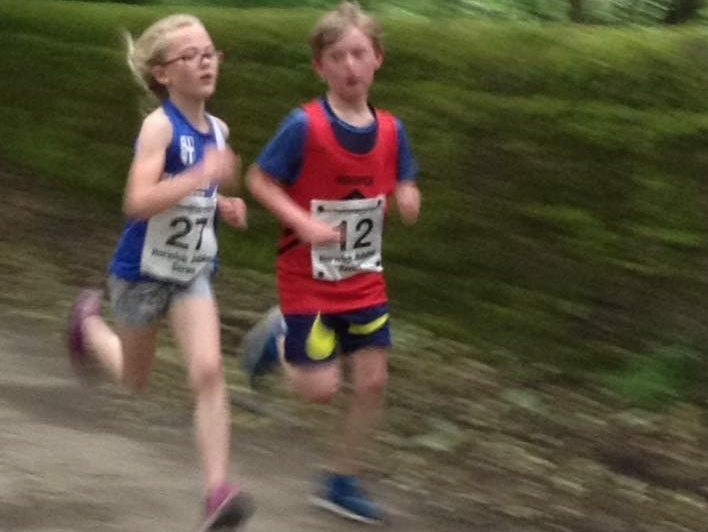 Kady Thompson took 61st position out of a 66 strong field with a time of 9.10 whilst brother Felix Thompson came 9th in his U9 Race which featured 42 youngsters. 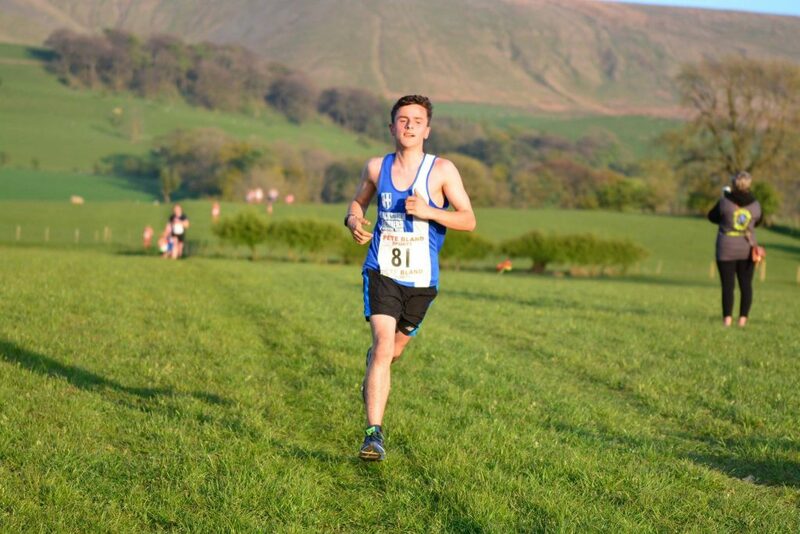 The latest in this years B&PGP Series took place on May 17th – WHOLAN NOOK TRAIL RACE – featuring 208 runners and won by Danny Collinge in a time of 30.23. Shaun Livesey was out in this Race for the Harriers coming home in 17th spot with a time of 33.37 and 4th V40 on the night. V50 Gary Pearse placed 66th in 38.11. It was an unusually small field for the first Race in this years Race Series of seventy eight runners and emphatically won by Gary Priestley in a time of 26.16. 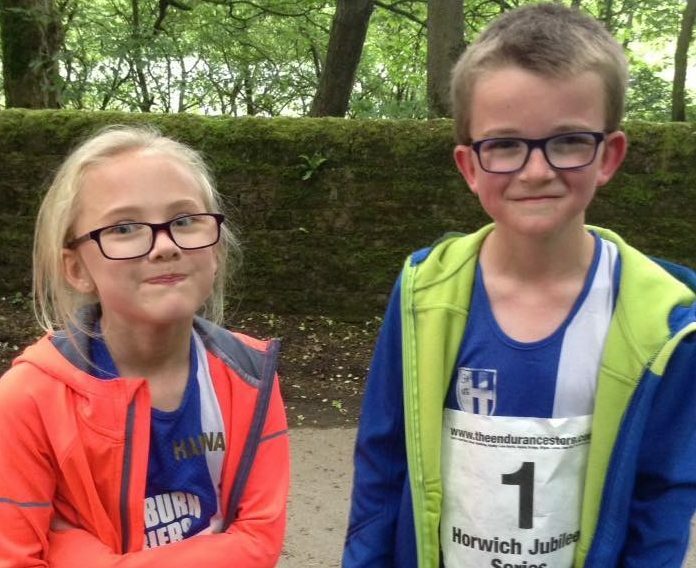 Four Blackburn Harriers took part which saw good runs from Jack Hindle taking 2nd place in a time of 28.02 in his first race over the distance on the road. 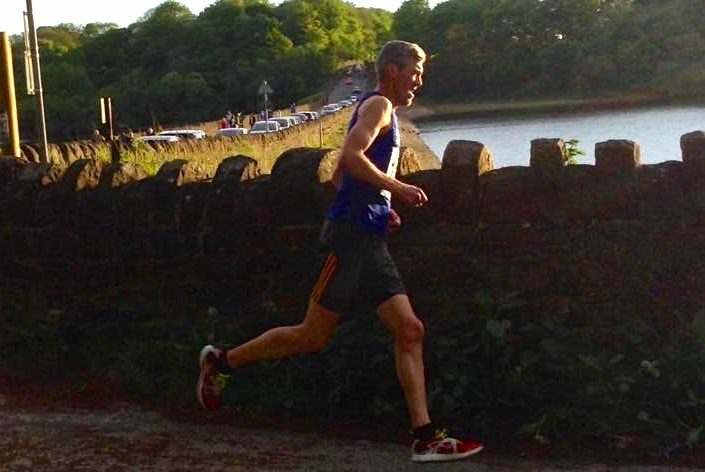 Just behind came Chris Davies in 3rd posting a time of 28.15 to give him the V40 1st Prize on the night and a PB on the Course. 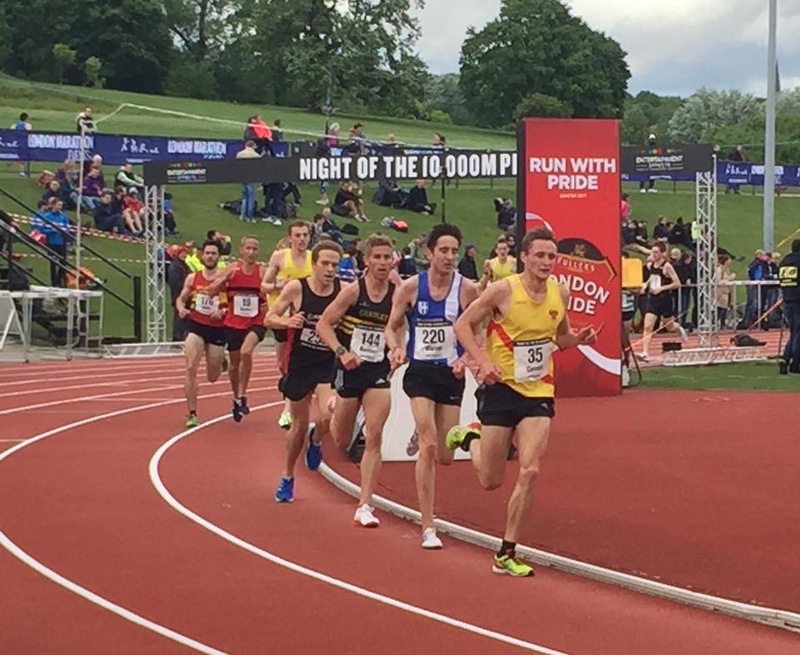 Lindsay Davies set a big new PB finishing 67th with a time of 42.05 while David Morris (V50) placed 76th in a time of 48.25. 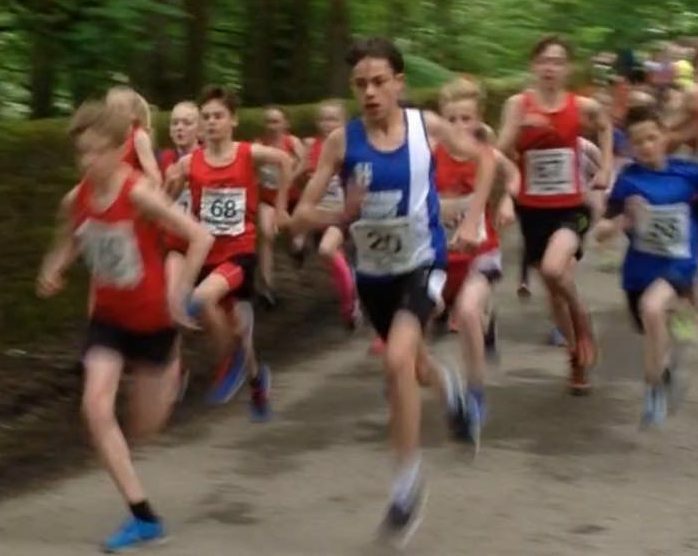 Two Junior Races with the U13 and U15 youngsters all racing against one another and it was a double win for the Harriers — Leon Thomas coming out on top winning in a time 5.00, some eleven seconds ahead of the 2nd placed Horwich runner and Amy Davies who placed 9th overall took the Girls Race in a time of 5.36. 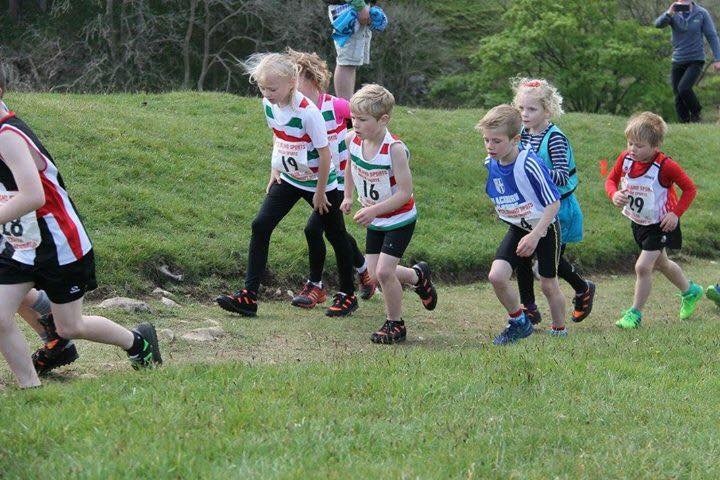 The other Junior Race featured 57 youngsters and first home for the Club was Oliver Gill who was 9th overall – 2nd U9 and in a time of 6.12. 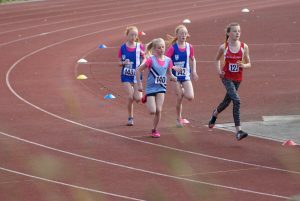 Hannah Davies was the 1st U9 Girl in 20th place (6.40), with Isabelle Hartley 23rd in a time of 6.44. 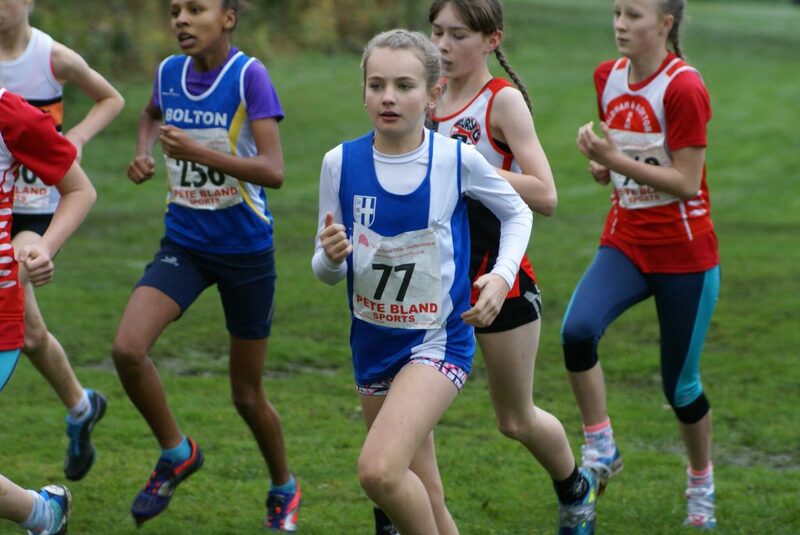 The youngest of the bunch – Lulu Sharp – ran a good time of 7.42 to finish in 40th place. 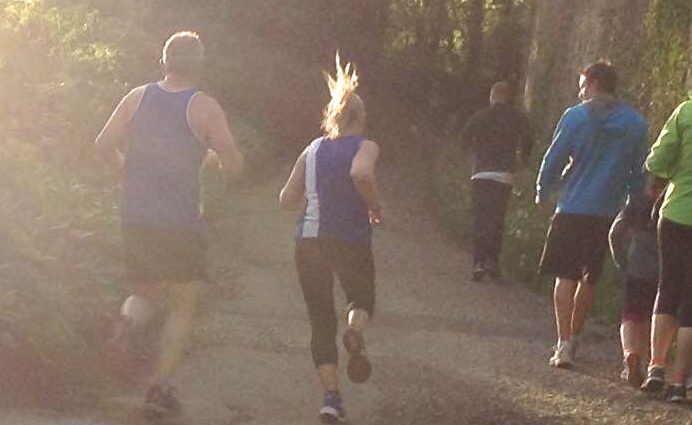 And last but by no means least is a big mention to Lorna Sharp who set a new PB at the Avenham Park 5k run on May Day with a time of 26.53 which meant she had chopped over three minutes off her previous best run. The day started off a bit gloomy with overcast skies and drizzle as the athletes arrived, pitching their tents, getting their numbers and preparing themselves for their respective events. 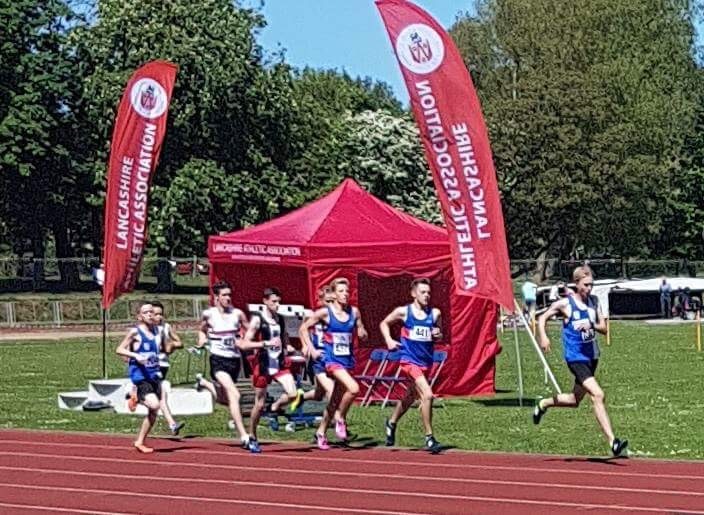 As the morning wore on, the weather brightened into a real summer atmosphere which rubbed off on the Harriers athletes who put in some very good performances on Day (1) resulting in Ten Gold Medals, Ten Silver Medals, Four Bronze Medals, Twenty Six new PB’s and a New Club Record. Tony Wood was delighted with the whole weekend and commented “As Chairman of Lancashire Athletic Association it was extremely pleasing and satisfying to see yet another successful Lancashire Championship held over two days of great weather in sunny Blackpool. 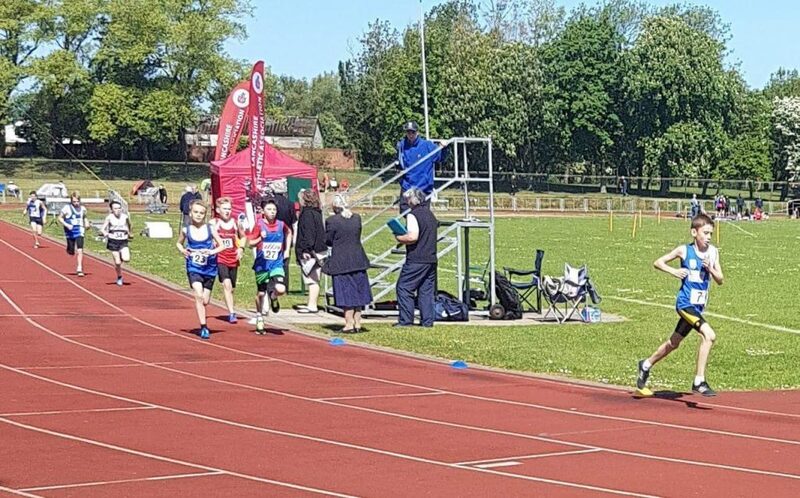 I would like to thank all those hard working officials who ensured the Championships went smoothly and of course the athletes from the County who performed with distinction including many championship best performances. 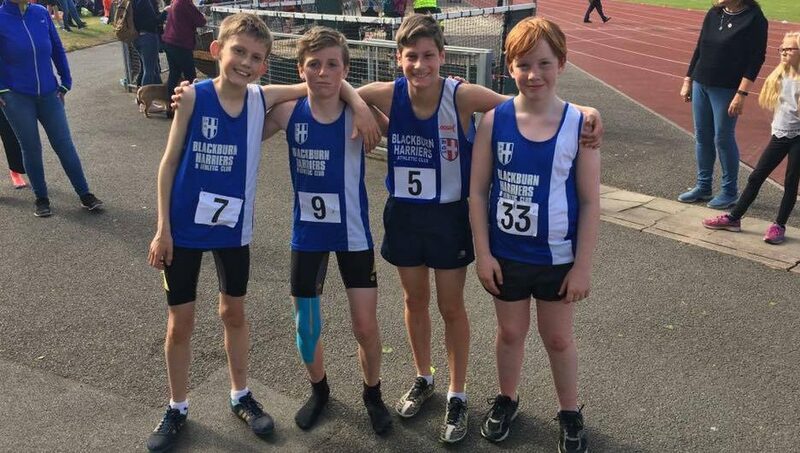 Well done to the athletes and officials of my own club Blackburn Harriers & AC and particularly Jim Kerrigan who was for the first time Championship secretary”. One of the stand out performances of the day came from U17 Anthony Kent. 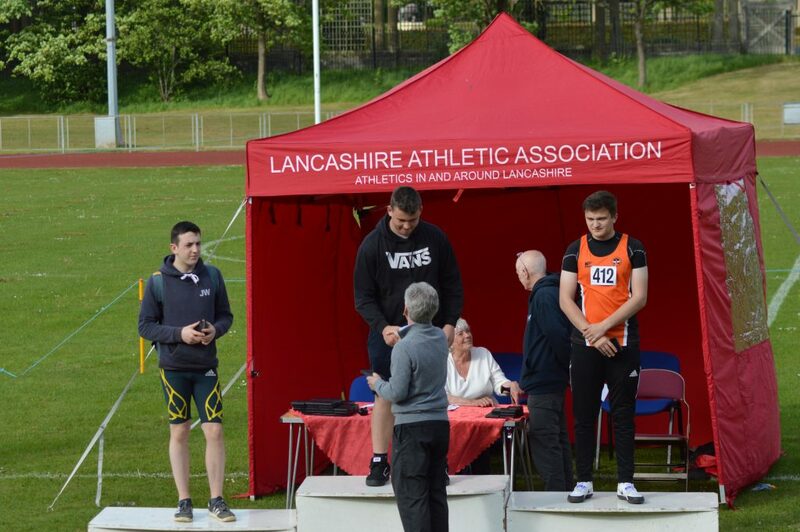 He won a County Title in the Discus with a new PB of 42.53m, won a Silver Medal in the Hammer with a new PB of 46.08m and added another Silver Medal in the Shot with a new PB of 13.12m which broke his own Club Record. 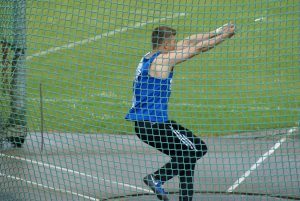 The icing on the cake came with the realisation that his Discus performance was an English Schools qualification distance. 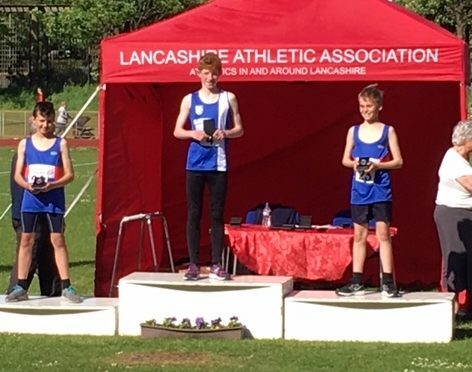 More County Titles and Gold Medals came for U13 Kyle Taylor-Pomfret winning the Hammer with a new PB throw of 23.75m, some seven metres added to his previous best distance and then adding the Discus Title, also with a new PB of 13.31m. 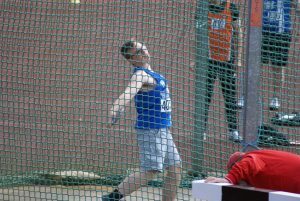 U17 Lucas Davies continued the trend of new personal bests with a PB throw of 28.04m in the Discus (6th) and added an 8th placed throw of 8.28m in the Shot. 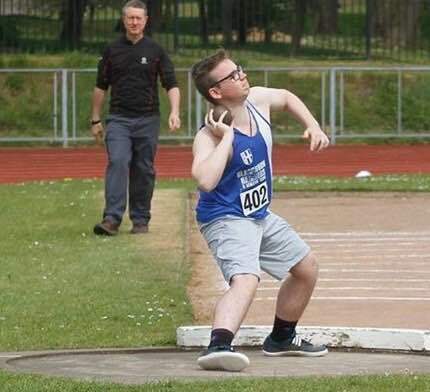 Sam Gaskell who had won the U15 County Title in 2016 replicated that this year taking the U17 Hammer title with a throw of 54.77m whilst U20 Jacob Roberts came 2nd in his Hammer competition reaching a distance of 62.77m. 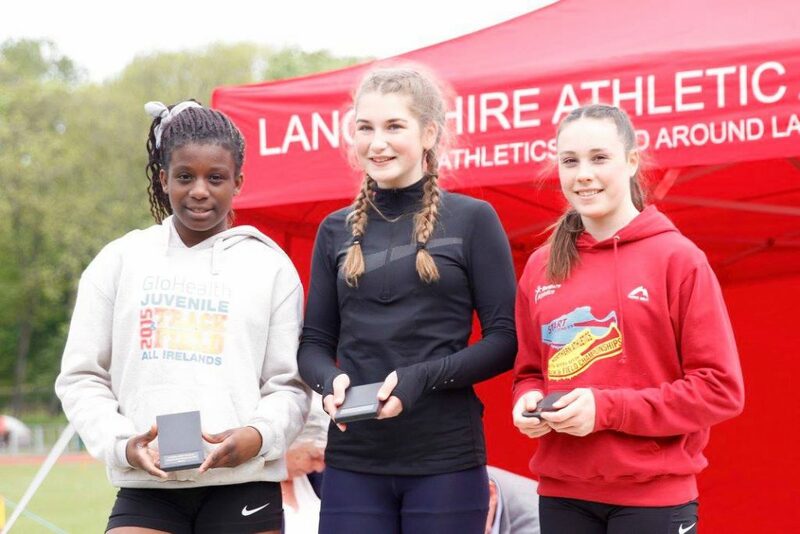 It was a good day for the Club’s Javelin throwers – Nicky Saunders seems to be setting new PB’s all the time and she did it again in the U13 Javelin taking the County title and a Gold Medal with a throw of 25.72m. 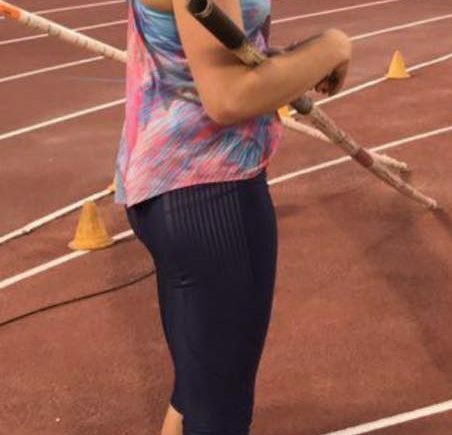 Caroline Woodworth also tried her hand in the Javelin and posted a very creditable throw of 15.74m (6th) in her first ever attempt at the event. 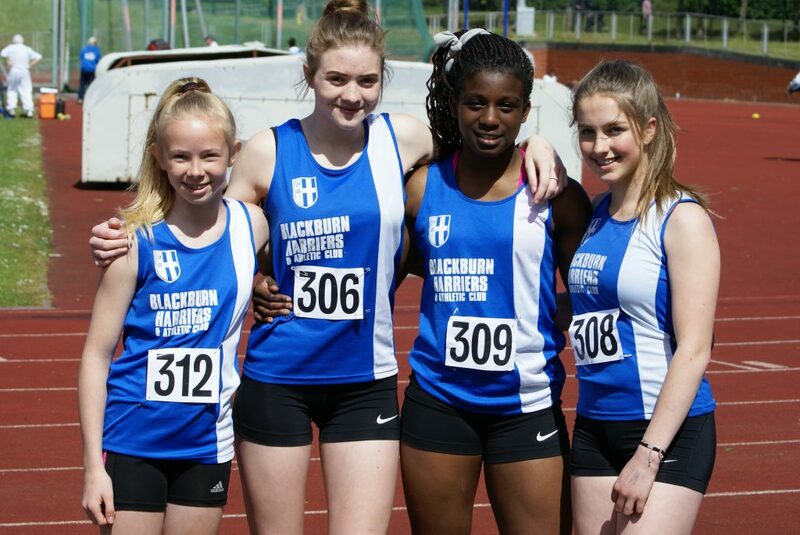 In the U15 Girls Millie Coy won the Javelin title with a new PB of 29.28m, over two and half metres further than her previous best, with Myah Booth in 4th place (23.95m) and Izzy Thompson (5th) with a throw of 21.25m and new PB for her. Anna Peers who has recently broken the Club’s Senior Women’s Record for the Javelin won the Senior County title with a distance of 38.92m. 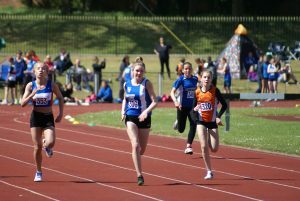 U15 Abigail Brown was the next Harrier to set a new PB adding over four metres to her previous best distance to set a new Javelin PB of 23.63m (7th) – Kieran Carroll finished 5th in the U15 Boys Discus (17.98m) just short of his personal best. 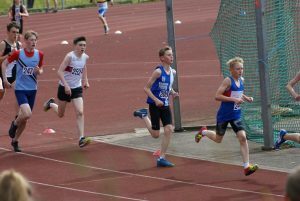 In the Sprints there was a new PB for U13 Codie Dewhurst in the 100m of 15.9 with Saul Sharp posting 16.4 and Joe Sims 18.3 in their Heats. 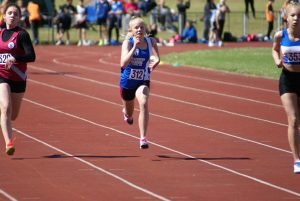 Abigail Stratton set a new PB of 14.7 in her U13 100m Heat and finished 6th in the Final in a time of 14.9. 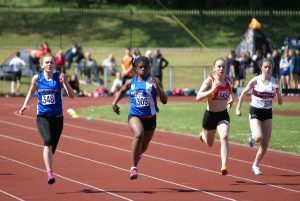 U15 Queen Tanimowo took 2nd spot in her Heat (13.2) – a new PB – and then replicated the time in the Final to win herself a Bronze Medal. Bailey Madden won her Heat in 13.6 and then ran a new PB of 13.4 in the Final for 4th spot. Amy Wiggans equaled her PB of 14.3 in Heat (3) followed by a new PB for Christie Sturgess of 14.1 in Heat (4). 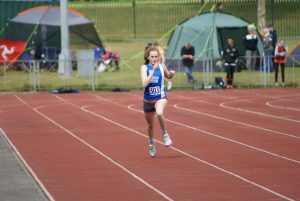 U17 Emily Warren set a new PB of 13.2in the 100m as she qualified for the Final where she placed 4th in 13.5. Chloe Bleeks ran 13.6 in her Heat to qualify for the Final and ran the same time in the Final to come home 6th. 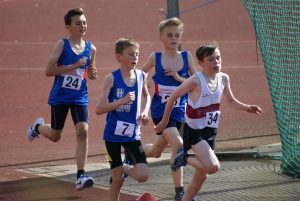 Spectators witnessed a great Race between Dexta Thompson and Tobias Swarbrick in the U13 Boys 1500m. Neither of them gave an inch as they took it in turns to attack one another and try and gain the lead. In the end Dexta finished 2nd in 4.50.0 with the winner edging it over the last 30metres. Kyle Taylor-Pomfret was having a great day with Gold Medals in the Hammer and Discus and added a new 1500m PB of 5.19.9 to place 5th with Saul Sharp in his first ever 1500m Race (11th) in 5.51.5 and Joe Sims, who starts with a smile and finishes with a smile, in 12th place (6.15.5). 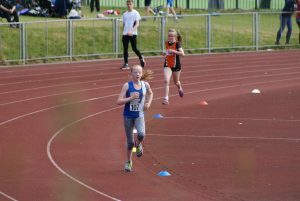 The U13 Girls 1500m Race saw Hollie Cubbon the first Harrier home in 4th place (5.26.7) a time just one tenth outside her personal best which is good running. Abigail Stratton chopped a whopping fourteen seconds off her her previous best to set a new PB of 5.27.1 (5th) followed by Caroline Woodworth in her first ever Race over the distance placing 7th in 5.34.0. 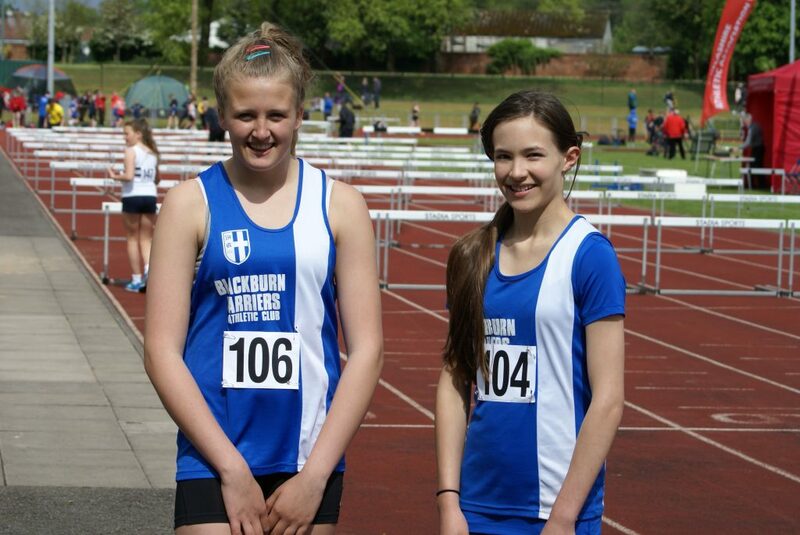 There was a new PB for Paige Singleton (13th) who ran a time of 5.56.5 with sister Ellie Singleton in 10th (5.53.1). 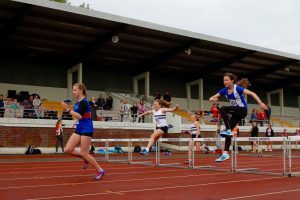 U15 Charlotte Collin was competing in her first ever track race and took on the 300m, recording a time of 49.5 whilst U17 Emily Warren who had a very busy day with Hurdles qualifying and Finals, Sprints qualifying and Finals as well as qualifying for the 300m Final ran 45.4 (8th), a case of a Race too far. 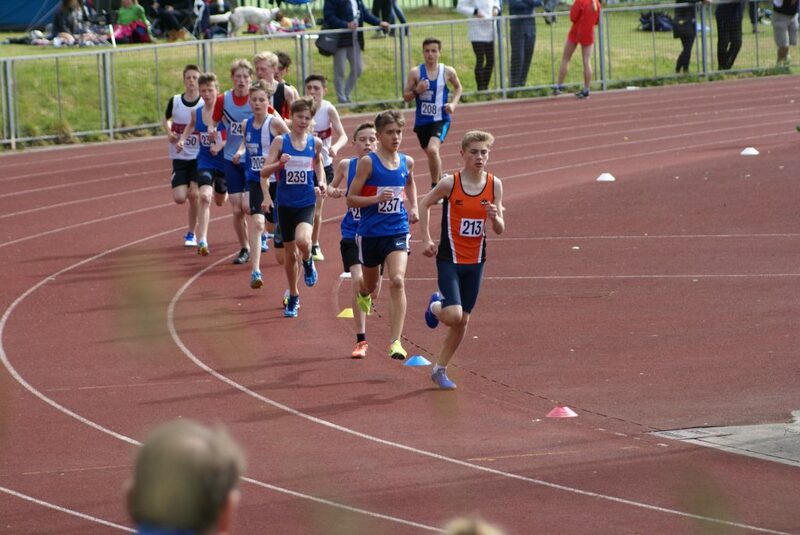 Another cracking Race in the U15 Boys 1500m between the Harriers Matt Ramsden and Preston’s Liam Blackwell. Matt cut a huge nine seconds off his previous best to come home 2nd in a new PB time of 4.30.2. 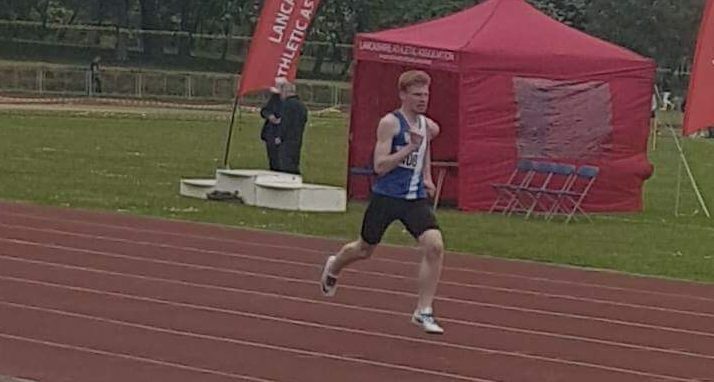 Jamie Teare came 7th with a time of 5.52.0 whilst Harry Wilkin, another athlete who was doing the event for the first time, finished in 14th spot with a time of 5.09.6. 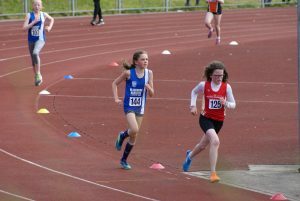 Amy Davies placed 4th in the U15 Girls 1500m Final with a time of 5.08.9 with Sophie Stanworth in 6th spot and setting a new PB time of 5.15.3. The U17 Women’s 1500m saw Maddie Elliott run just outside her personal best when she came home in 2nd spot (4.55.1) after a great battle with Lydia Wilcock which wasn’t settled until the home straight. Freya Black came in 8th with a time of 5.44.5. 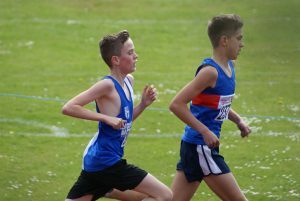 In the U15 men’s 1500m it was first time over the distance for both athletes – Joe Gebbie finishing 6th with 4.30.8 and Thomas Betty 8th in 5.34.0. In the 5000m, it was the 2016 winner Tim Raynes who won again this year with a time of 15.22.7. Tim pushed it from the off to open up a gap between himself and Rob Webb which proved to be decisive. 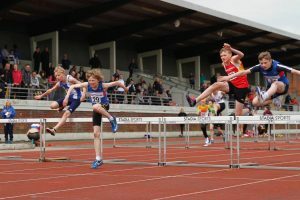 There was a new PB of 13.5 and a Silver Medal for Rory Teare in the 75m Hurdles, a first time in the event for Ben Boocock (7th) in 17.0 and a new PB for Codie Dewhurst of 18.0 in 8th place. 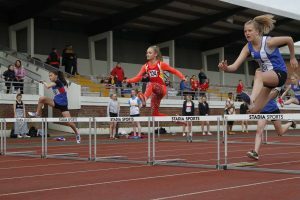 Paige Shannon set a new PB of 12.9 in winning her U13 70m Hurdles Heat on the way to a time of 13.0 in the Final which earned her a Bronze Medal. Emma Love ran 14.5 in her Heat to qualify and then ran 13.5 in the Final for 5th spot. 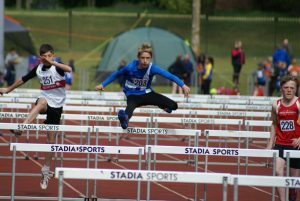 Harry Jackson set a new PB of 15.6 in the 80m Boys Hurdles (5th) whilst Myah Booth won both her Heat (12.2) and the Final (12.1) of the U15 75m Hurdles. 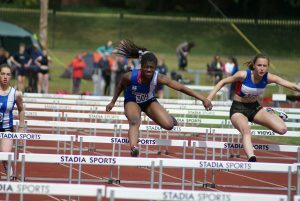 There was another Medal for the Harriers in the 75m Hurdles with Queen Tanimowo coming home 3rd in 12.5. 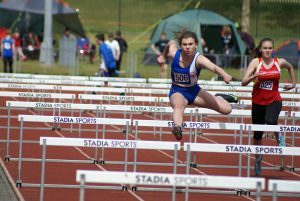 Christie Sturgess placed 8th in the Final with a new PB of 13.4. Phoebe Baxter came 6th in Heat (2) 13.4 and Liberty Thompson 4th in Heat (3) with 13.9. 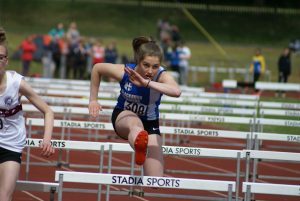 Nick Massey was just edged out into 2nd place, earning him a Silver Medal in the U17 Men’s 100m Hurdles in a new PB of 14.2 whilst Emily Warren also took Silver in the U17 Women’s 80m Hurdles in 12.8. 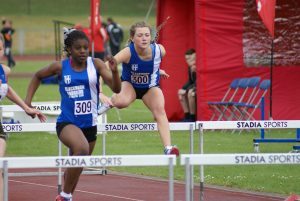 Morgan Angland was unfortunately the only contestant in the U20 Women’s 100m Hurdles so she was put in the Race with the sole Senior Woman in the Event and ran 16.0 to take the U20 County title. 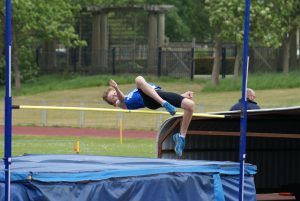 Finishing Day (1) with the Jumps saw Rory Teare take another Silver Medal in the U13 Boys High Jump with a PB equaling clearance of 1.35m and brother Jamie Teare take a Bronze in the U15 Boys Hiigh Jump (1.45m). 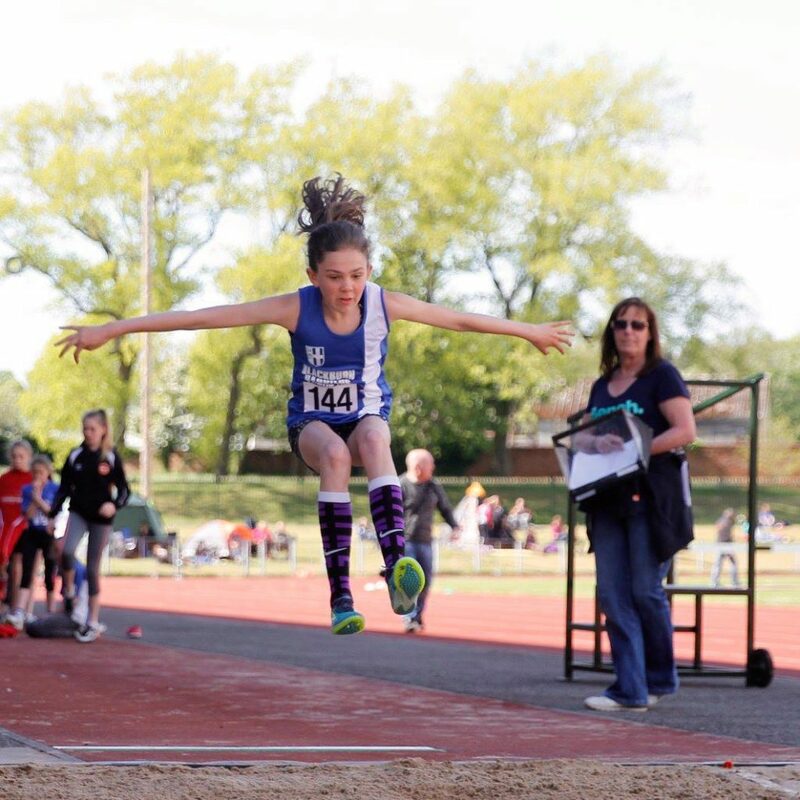 Paige Shannon placed 11th in the U13’s Long Jump with 3.75m – Abigail Stratton set a new PB of 3.02m (20th). 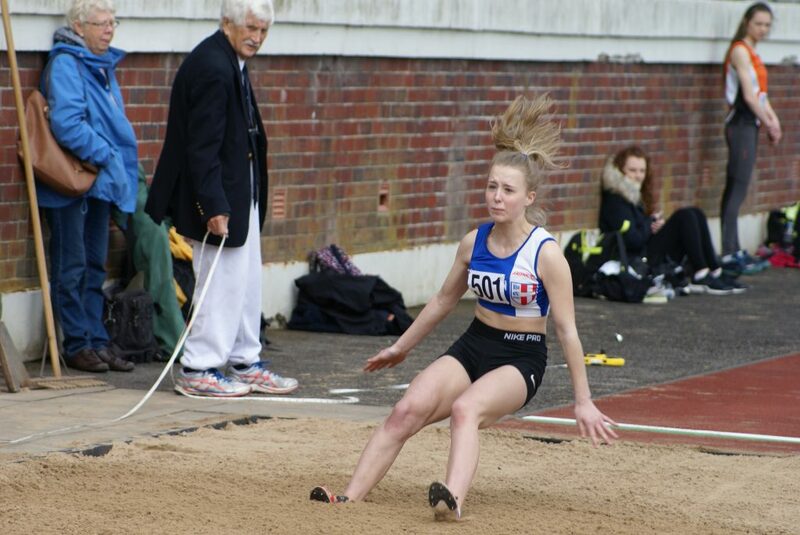 U17 Chloe Bleeks cleared 4.38m in the Long Jump (7th). More sunshine and more great performances on the second day with the Harriers winning another 13 Gold Medals, Five Silver Medals, Four Bronze Medals and setting Eighteen new PB’s including a Championship Best performance set by Charlotte Williams – currently ranked Number One in Britain – in winning the U17 Women’s Hammer with a throw of 55.85m. 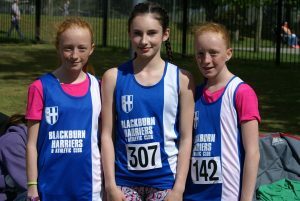 Another young Blackburn Harrier demonstrated the current depth in the Club’s Throw Squads when U13 Nicky Saunders won three County Titles with three new PB’s in the Shot Putt (7.79m), the Discus (24.76m) and the Hammer throwing 24.71m – on Day One she had won the U13 Javelin with a new PB of 25.72m to make it four County Titles and four new PB’s over the weekend. 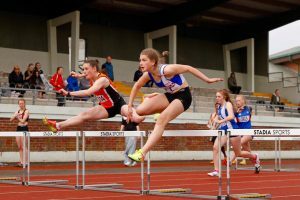 A tremendous performance by this young athlete and others who are being produced by the excellent Coaching of Mick Hitchon and Jim Kerrigan. 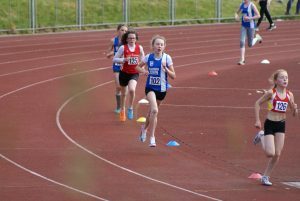 U13 Caroline Woodworth set a new Shot Putt PB with 5.69m and took on the Discus for the first time ever, posting a distance of 14.41m. 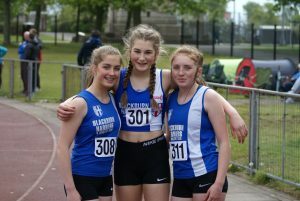 In the U17 Women’s Throws Holly Brookes won two Silver Medals in the Shot Putt (6.73m) and Discus with a throw of 22.41m an event which saw Charlie Coy taking a Bronze Medal after throwing 18.61m. 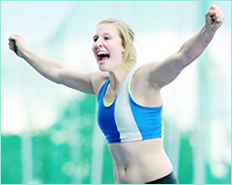 It was a double Gold Medal for Anna Peers winning the Senior Women’s Discus title with 35.04m to add to her Javelin title won the day before. 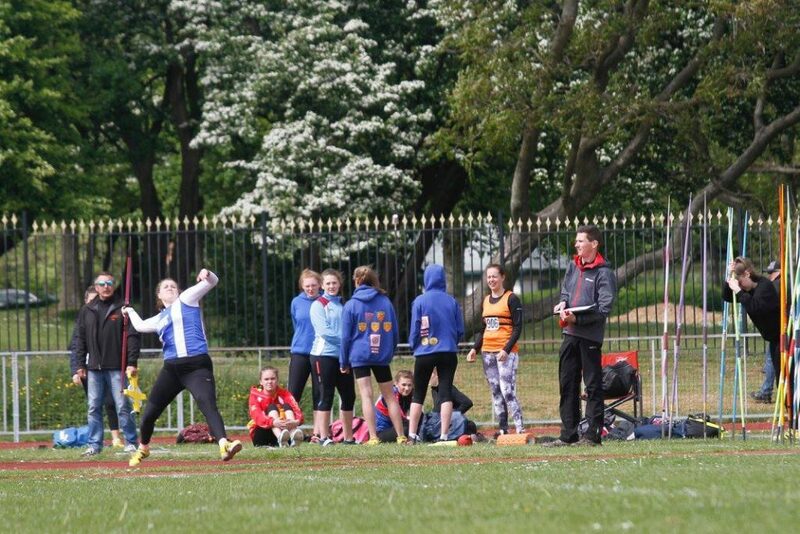 Day Two produced even more Medals for the Club’s Throws athletes including a Bronze Medal for U15 Myah Booth in the Shot Putt (9.14m) who then took on the Hammer for the first time finishing 8th with a throw of 19.75m, a Gold Medal for Izzy Thompson in the U15 Girls Discus (23.30m) as well as setting a new PB in the Hammer (7th) with 21.45m and placing 6th in the Shot Putt (7.26m). 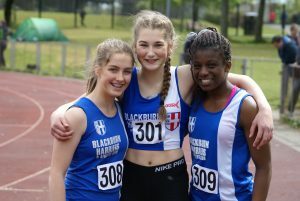 Abigail Brown (U17) made it three new PB’s over the weekend in the Throws adding new personal bests in the Shot Putt (4th) with 8.16m, 4th in the Discus with 20.12m along with a throw of 23.63m in the Javelin. 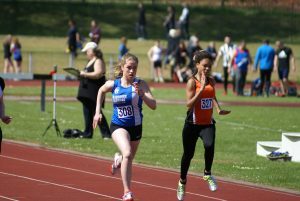 Hannah Proctor won herself two Medals with a Silver in the U17 Shot Putt (9.96m) and a Bronze in the Discus throwing a distance of 22.75m. 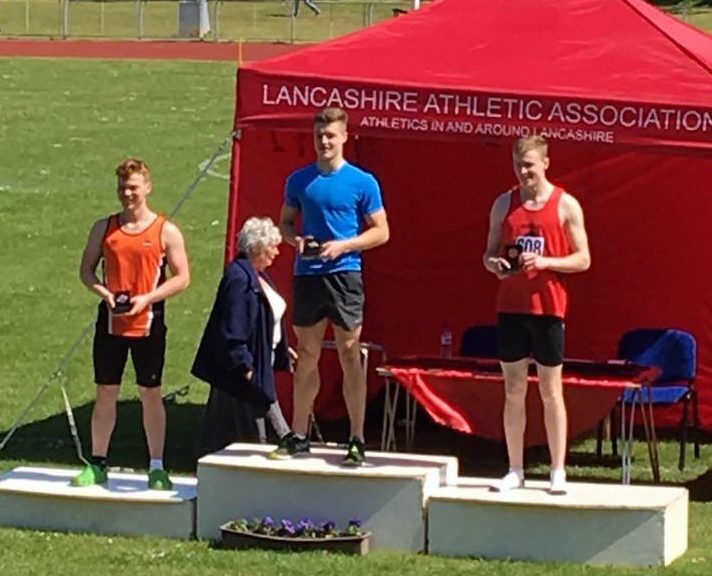 U15 Cameron Harris set the English Schools qualifying standard at the YDL a few weeks ago for the Javelin. 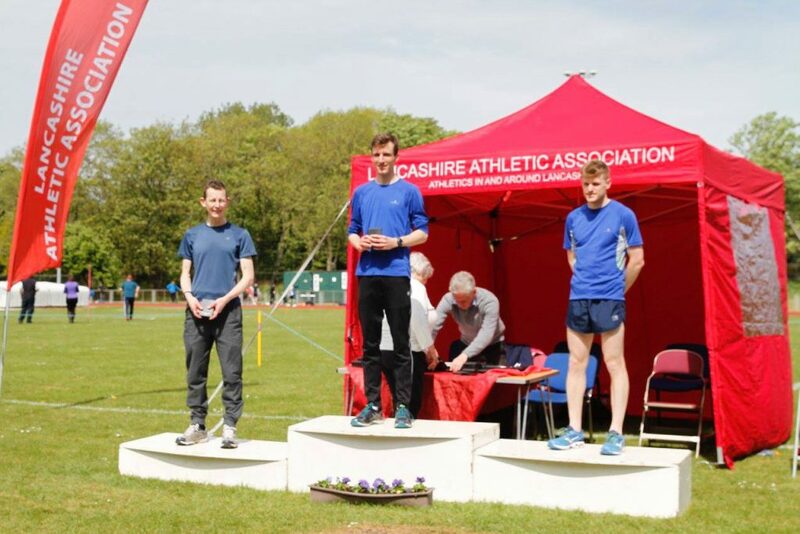 At the Championships he did it again to take the County title with a new PB of 43.34m, a distance which puts him at Number One in the North West and 13th in the National Rankings.. Kieran Carroll placed 5th with a throw of 25.30m and George Whittaker threw a new PB distance of 22.40m (6th). 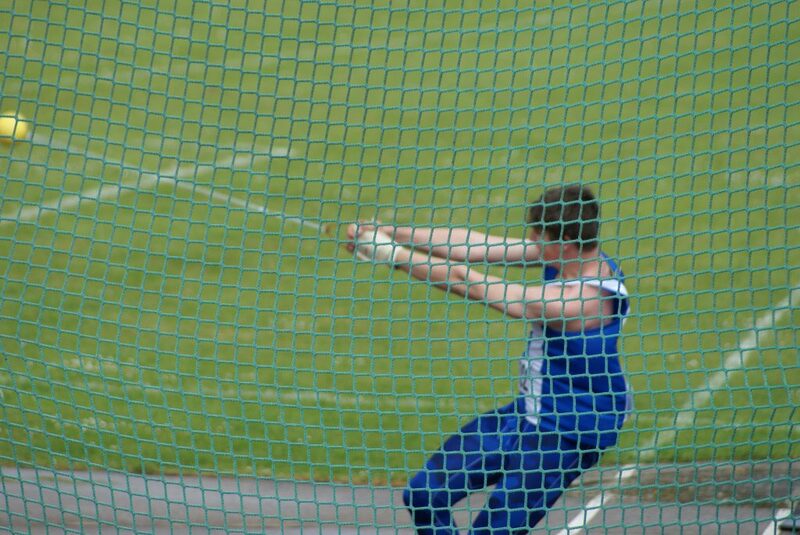 Brother Ben Whittaker tackled the U17 Javelin for the first time and threw solidly for a 4th place (27.72m) with Lucas Davies 5th with a throw of 23.14m. 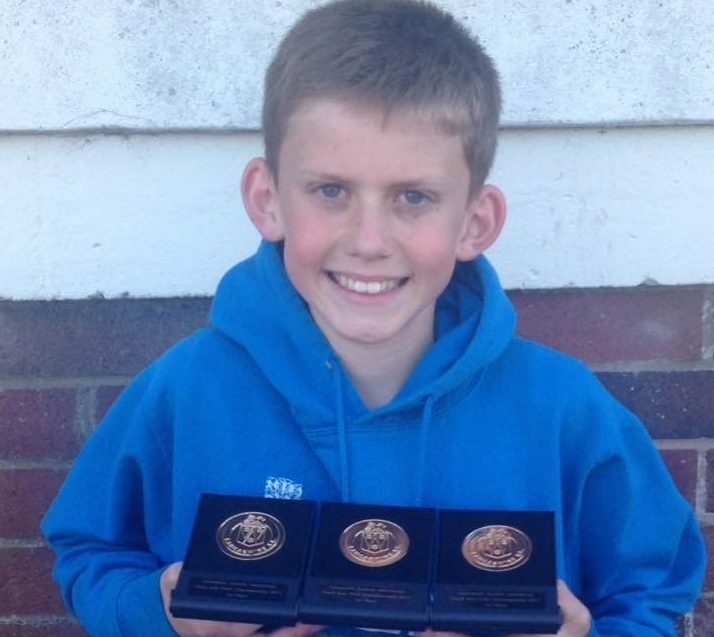 U13 Kyle Taylor-Pomfret who had a great weekend won the U13 Boys Javelin with a new PB throw of 23.79m. 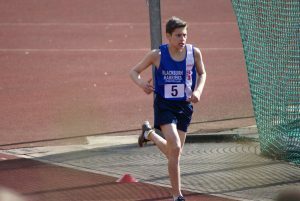 The County Titles and very good performances continued on the Track and none more so than in the U15 Boys 3000m where Matt Ramsden chopped a half a minute off his previous best to win the Gold Medal in a time of 9.34.4 which takes him to Number One in the Rankings in the North West and 10th Nationally. 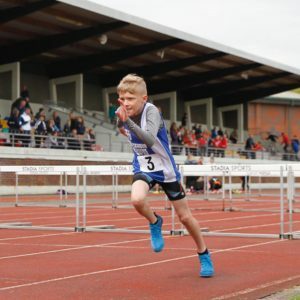 George Whittaker had his first ever attempt at a 3000m Race and came 5th with 12.15.6. 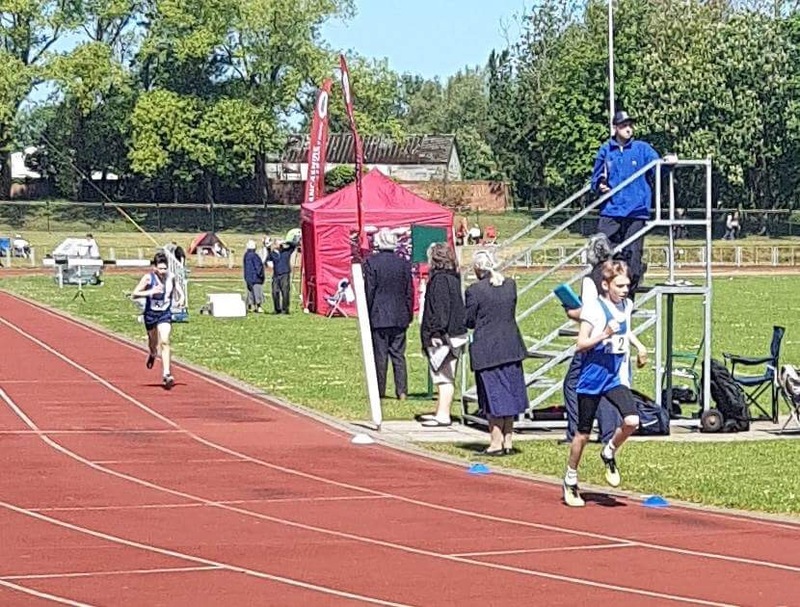 U17 Nick Smith was the only competitor in his age group when he lined up in his first time over the distance running a good opening time of 10.09.6 to take the Gold Medal. 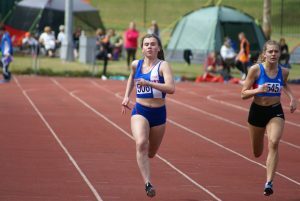 Maddie Elliott took the 3000m U17 Women’s Title in a time of 10.42.7 some four seconds clear of second placed Eleanor Ward. Hannah Cookson qualified for the U17 Women’s 800m Final after running 2.35.8 in her Heat (4th) and came home 8th in the Final itself with 2.39.5. 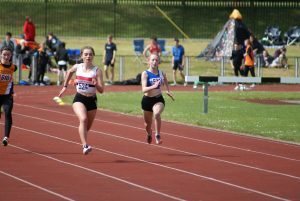 Sophie Stanworth and Eleesha Charnley contested the U15 Girls 800m but didn’t manage to qualify for the Final but both ran pretty solid times with Eleesha posting 2.33.8 (5th) in her Heat and Sophie 2.34.0 (6th). 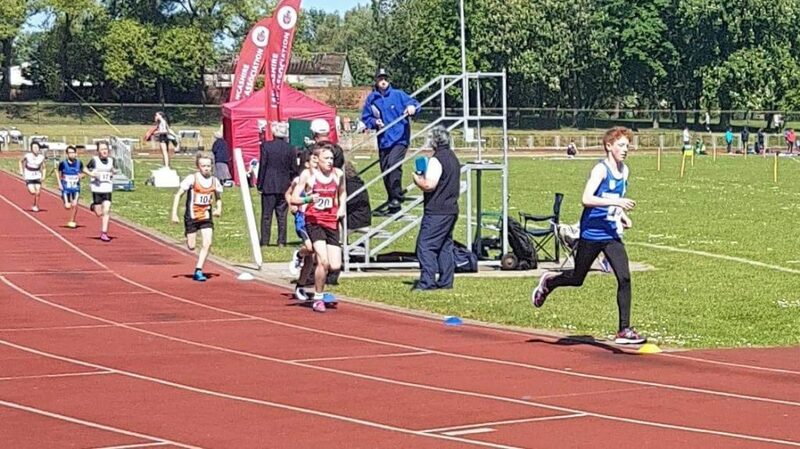 Another great performance came from Hayden Mercer in the U13 800m as he ran 2.32.3 to win his Heat and then stepped it up to take the Final and title of County Champion with a time of 2.29.4. Kyle Taylor-Pomfret set one of six new PB’s over the weekend, qualifying for the Final with 2.35.7 and then placing 6th in the Final (2.39.7). Isaac Butler came 6th in his Heat (2.41.1) and Saul Sharp placed 7th (2.50.2). 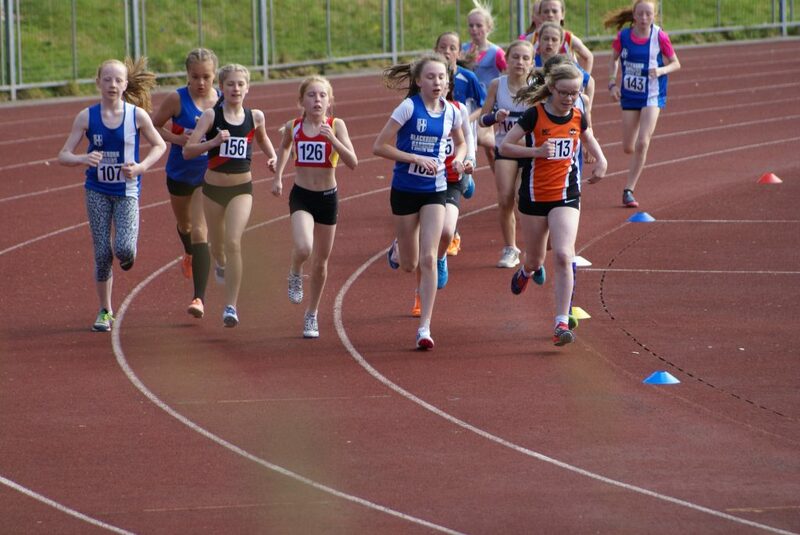 The U13 Girls had four athletes in the 800m who didn’t make the Final but all had a good go with Kiera Haxton 5th in Heat (1) 2.56.2 and a new PB, Caroline Woodworth 3rd in Heat (2) in 2.44.8 and her first time over the distance, Kate Cookson 4th in Heat (3) with 2.49.0 and Kiera Booth 7th in Heat (3) 3.06.08. Leon Thomas was just tenths away from his personal best, run three weeks ago, when he came home in 2nd spot in the U15 800m in a time of 2.13.7 to win himself a Silver Medal. The winner on the day ran an exceptionally quick first lap and finished up just outside the Championship Best Performance. 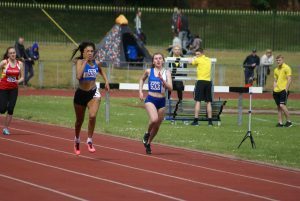 In the U15 200m Bailey Madden and Queen Tanimowo both qualified for the Final from their respective Heats with Bailey placing 6th in the Final (28.0) and Queen 8th (28.2). 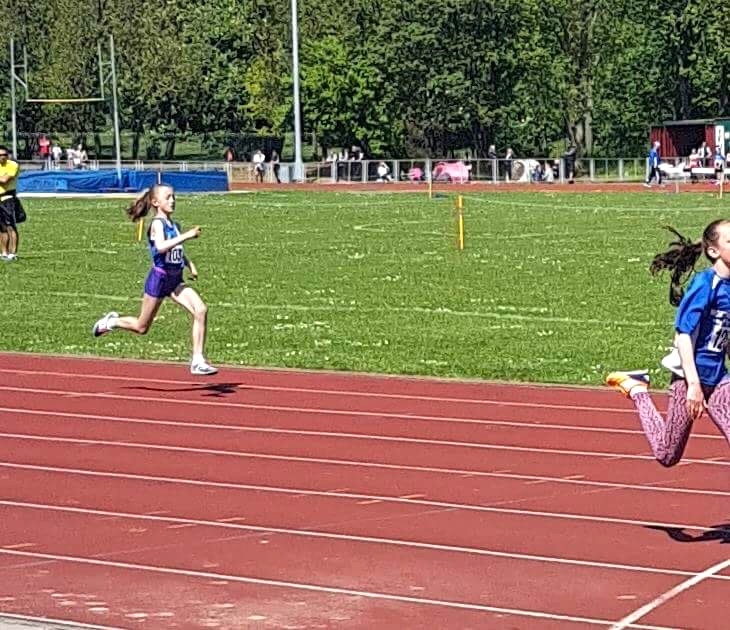 Charlotte Collin in her first ever Championship and Track experience ran 30.4 (6th) in her Heat whilst Eleesha Charnley came home 4th in her Heat with a time of 29.1. Chloe Bleeks qualified for the U17 200m Final with a time of 28.8 and placed 6th in the Final (28.5). 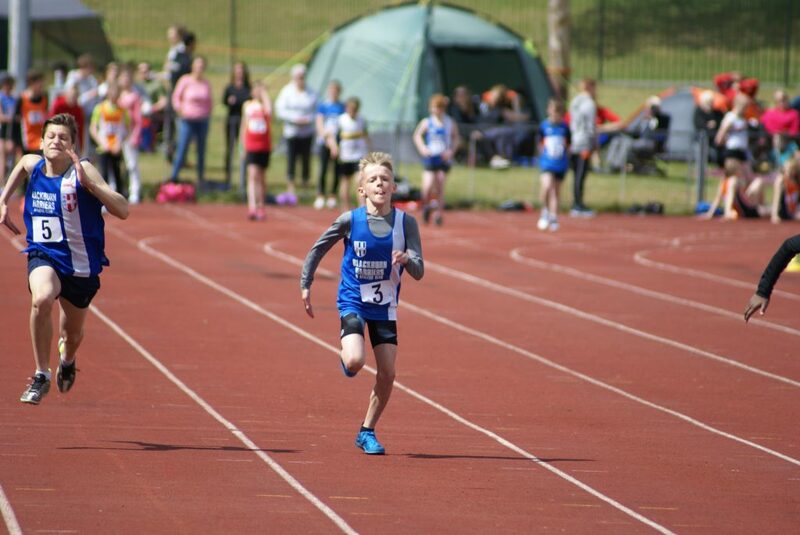 Kyle Taylor-Pomfret came 7th in the U13 Boys 200m Final (31.2) after setting a new PB of 30.8 to qualify. Saul Sharp ran 33.0 (6th) in his Heat. 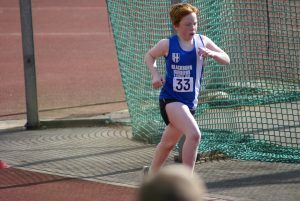 Kiera Haxton ran a new PB of 34.0 in her Heat of the U13 Girls 200m with Kiera Booth placing 7th in 35.0 in her Heat. Charlie Coy came home in 7th spot in the U20 Women’s 200m in a time of 28.6. 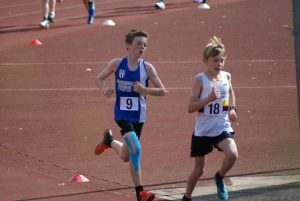 Ben Whittaker ran 26.0 to qualify for the Final in the U17 Men’s 200m where he finished 8th running a new PB time of 25.4. 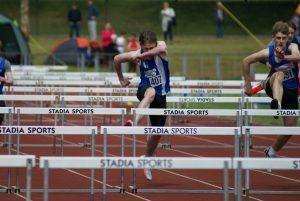 Ross Liddle won the Men’s 400m Hurdles with another English Schools qualification standard of 55.4, the second time in the last fortnight he has run that time and one which takes him to Number 5 in the National Rankings. Solomon Brown had to run solo in the U17 400m Hurdles but ran a solid 67.0 in his first attempt over the distance and won himself a Gold Medal as well. 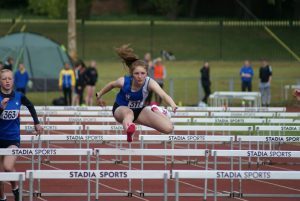 Bottom of age U17 Emily Warren won a Silver Medal in her first ever attempt at the 300m Hurdles with a time of 49.5. 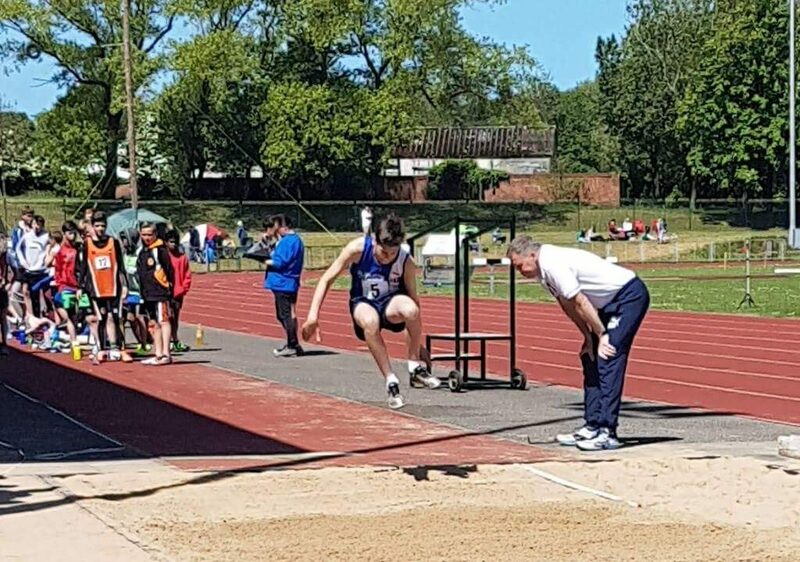 There was a Bronze Medal for Jonathan Gough in the U15 Men’s Long Jump with a new PB distance of 5.26m and a 5th place in the Final of the U17 Women’s Triple Jump for Chloe Bleeks clearing 9.17m. 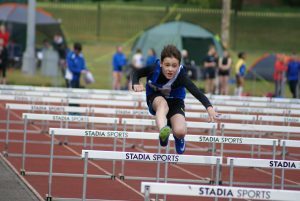 Isaac Butler came in 10th in the U13 Boys Long Jump with 3.30m and Saul Sharp placed 12th with a distance of 3.12m. 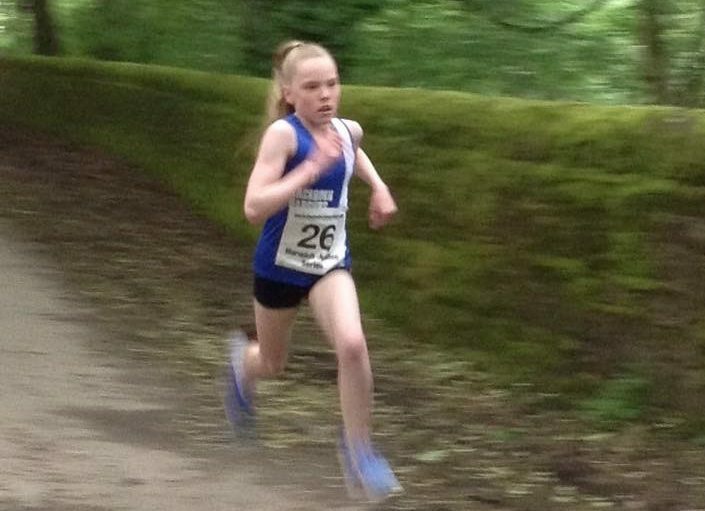 U13 Leah Hoole decided on a run out at this local 5k Race on Wednesday evening finishing 35th overall out of a field of 125 runners and 2nd Female Junior with a time of 20.38 which was great running by her. 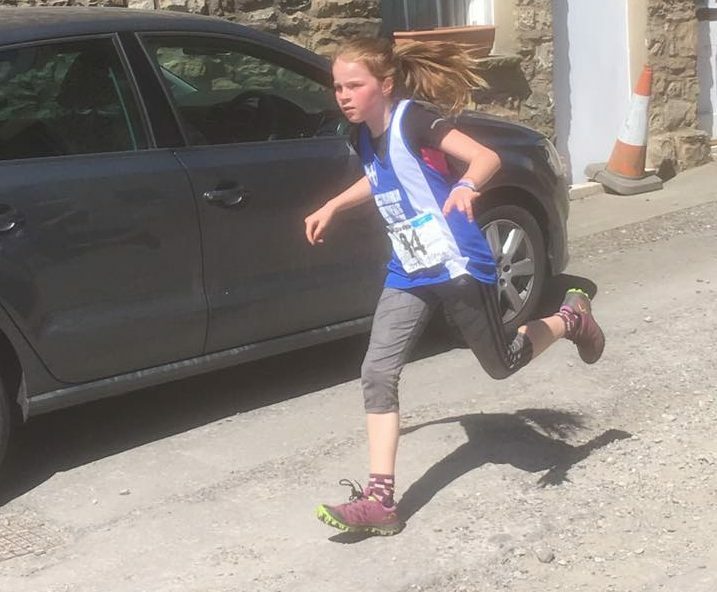 First Race in this years BOFRA (British Open Fell Runners Association) for the Junior categories and run in warm sunny conditions at the Sedbergh Gala Fell Race on May 7th. 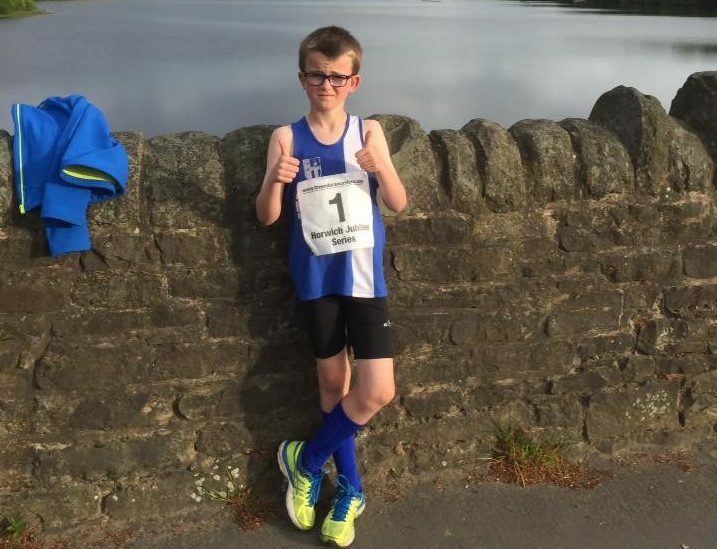 Dexta Thompson had a very good run to finish 3rd overall and 3rd Boy in the mixed U12 Race with a time of 12.43. Sister Kady Thompson competed in the same Race placing 30th overall and 12th Girl with a time of 11.26 and just one second separating the Girls in 28th, 29th and 30th place. 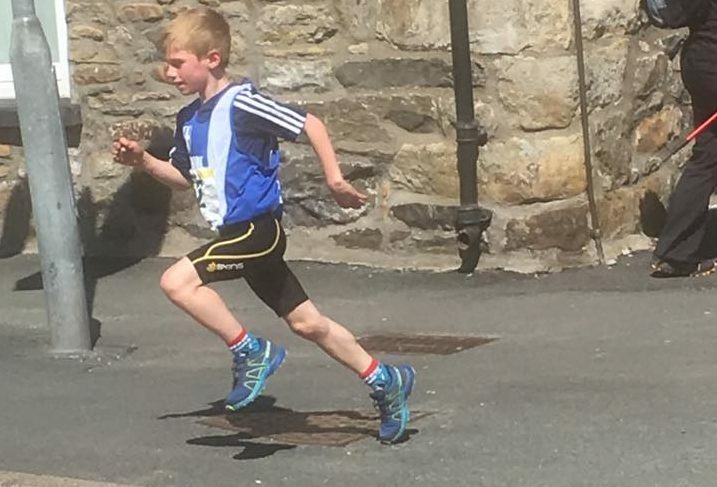 In the U9 Race Felix Thompson came home 8th overall and 7th Boy, posting a time of 6.19. Great weather for the Gt. 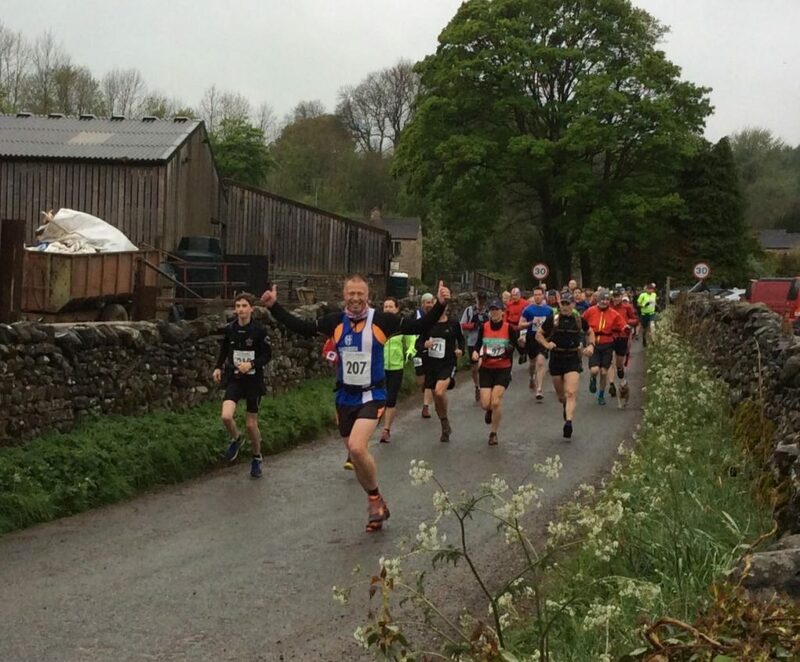 Hambledon Hill Race greeted the two hundred and forty eight runners on Sunday May 7th, a Race won by Steven Snape by over two minutes in a time of 36.33. Great to see V50 Gary Pearse back racing after such a long time out and having endured a torrid time with back issues. Gary came home in 60th spot with a time of 49.00 and was 8th in his age category. 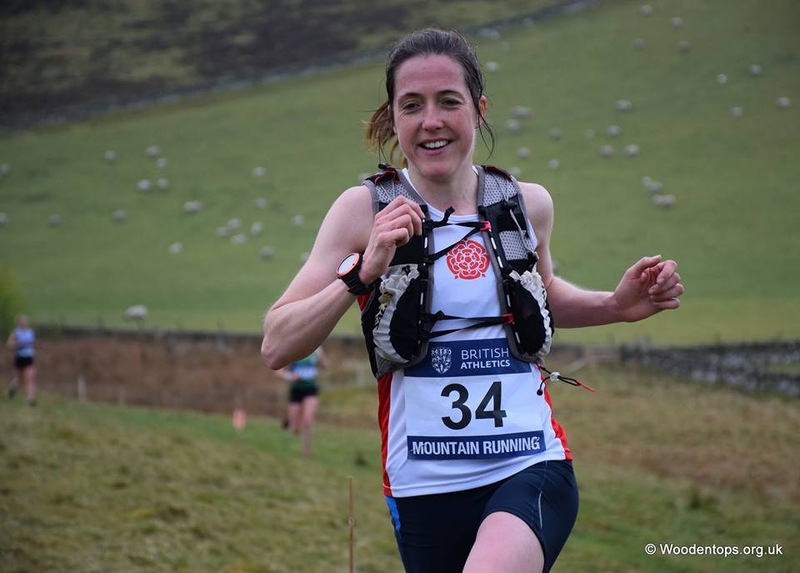 Good also to see V50 Alison Armour back in the Blue & White a she came home in 231st spot in a time of 73.35. 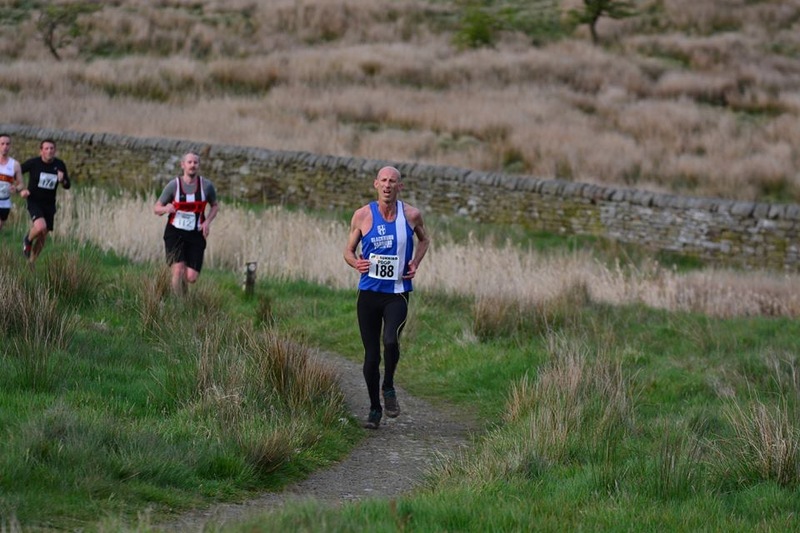 A couple of Blackburn Harriers out in this Race which saw John Horrocks come home in 14th spot out of the one hundred and ninety four runners who finished the race in a time of 35.33. 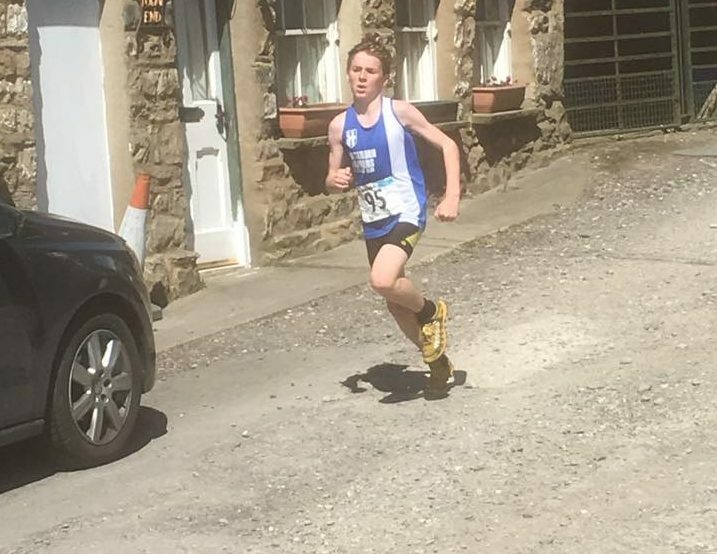 14yr old Harry Wilkin also tackled this Race, which isn’t easy by any stretch and featuring a pretty tough climb. He ran well to place 90th overall in a time 44.17. 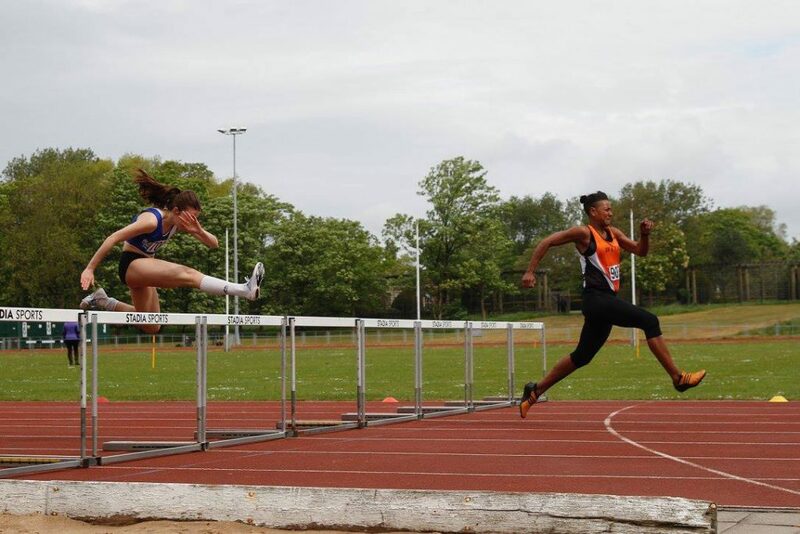 Blackburn Harrier Holly Bradshaw was competing in her first outing of the year in the Diamond League last weekend and she got off to a great start with first time clearances at 4.45m and 4.55m to finish 4th overall. Holly was pleased with her competition and spoke to the Club afterwards telling us “It was a solid performance from me in Doha. I felt content but left wanting slightly more! Training has been going really well so I am now excited to head back to full run for the rest of the season and hopefully get close to my PB. Technically and physically I am the best place I’ve ever been so I’m hoping this reflects in my results this year. My main aim is still to stay healthy and enjoy being back doing my sport”. 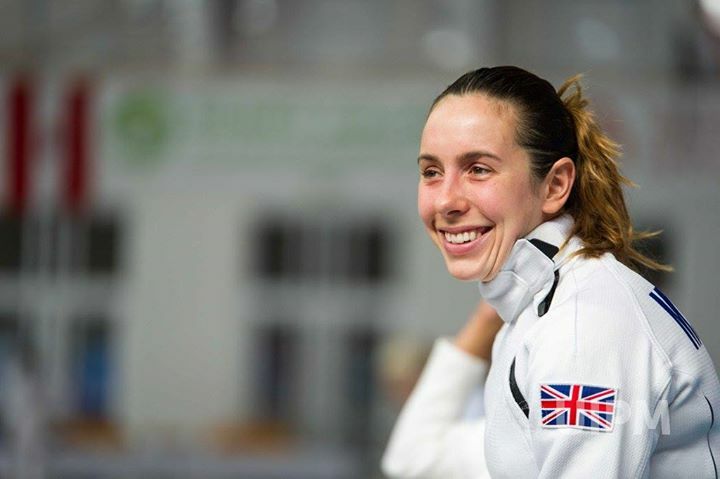 Samantha Murray was selected to represent Great Britain in the 3rd Event of the World Cup Series held in Hungary last weekend – the previous two being held in Los Angeles and Cairo. Samantha qualified for the Final which was contested on Saturday May 6th. In the Final Samantha finished 4th overall at the end of the swim phase with a time of 2.13.28 and followed that up with a good performance in the fencing, scoring 20 victories. 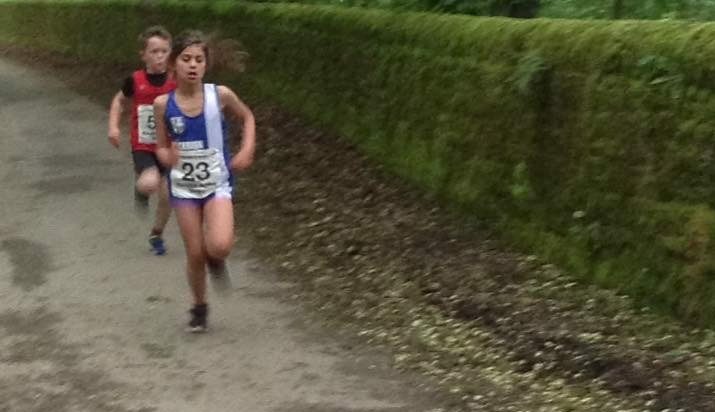 The combined results at this stage meant that Samantha was in 8th spot overall and the leading athlete from GB. Unfortunately, as sometimes can happen in the Modern Pentathlon, Sam got a really bad horse for the riding phase of the competition which undid all the good work she had put together in the Swim and Fencing. The next round of the World Cup will be held in Drzonkow, Poland (25th-29th May) with the World Cup Final being held in Druskininkai, Lithuania from 23rd-25th June. 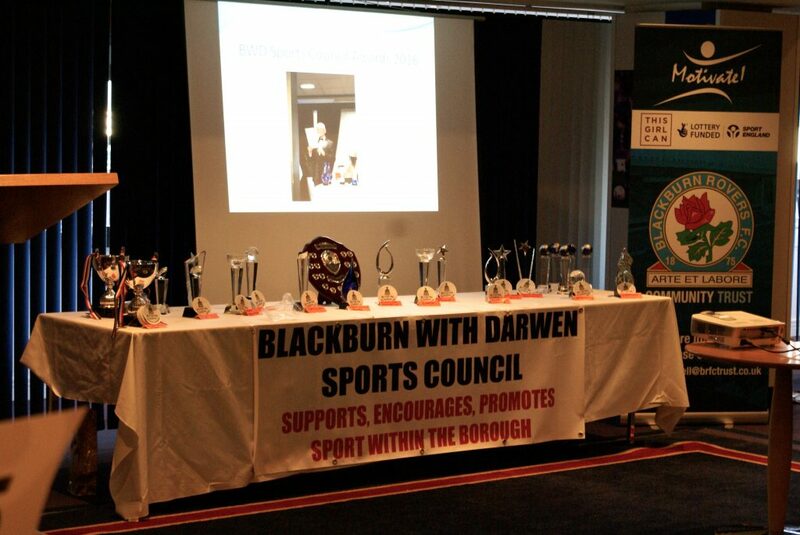 Blackburn with Darwen Sports Council held its Annual Sports Award Evening on Friday May 5th in the Legends Lounge at the home of Blackburn Rovers Football Club – Ewood Park. Team of the Year — Primary School of the Year — Secondary School of the Year — Community Club of the Year — Young Volunteer of the Year — Adult Volunteer of the Year — Official of the Year — Lynn Hindle Award — Coach of the Year — Young Achiever of the Year — Services to Disability Sport — Junior Sports Personality — Senior Sports Personality — International Award — Lifetime Achievement Award. 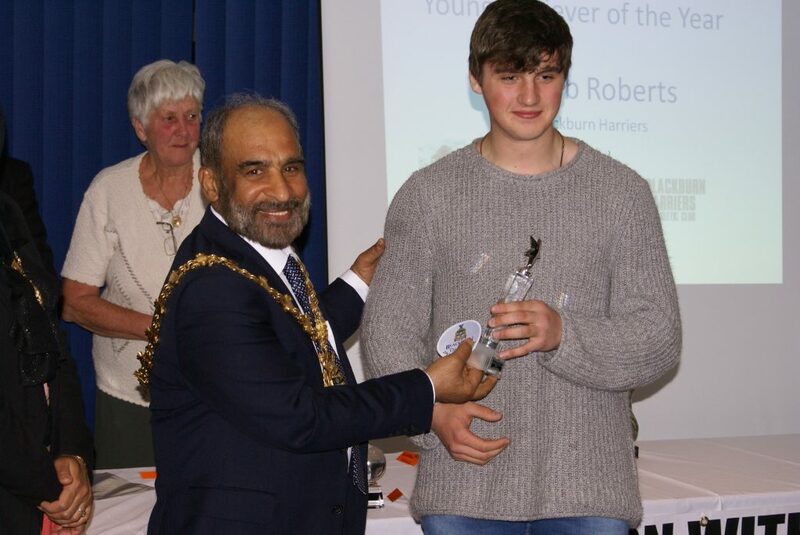 Added to this list of Awards was a very special one deservedly made to Blackburn Harriers Club President – George Kirby. 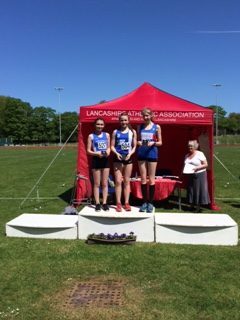 It was an Award in recognition of over 70 years of commitment to athletics in the Borough, in Lancashire and at National level. In moving the Award. 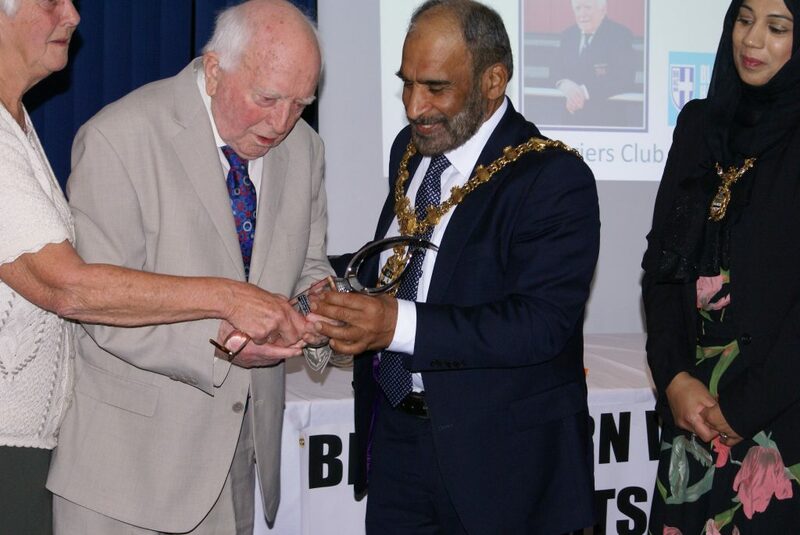 June Steele of the Sports Council told the audience that it gave ‘her great pleasure to pay tribute to a man who had dedicated 71 years to the role he has played in the development of athletics in the Borough of Blackburn with Darwen’. June went on to say ‘this journey began in 1946 when George, the PE teacher at Blakey Moor Boys School joined the Harriers. With several other enthusiastic teachers – Clarence Fairhurst, John Charnock, George Armistead – these were the main foundation of Inter-School Sports and Competitions in Blackburn – football, cricket and athletics’. 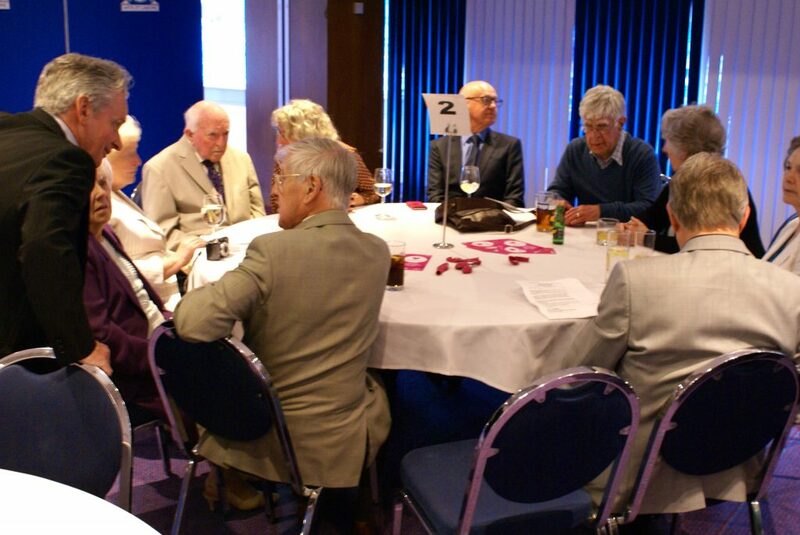 (George with Family and Guests including Club Chairman Tony Wood, Life member of Blackburn Harriers Ken Adroft and his wife, former International Sprinter Barry Kelly, George’s daughter and son-in-law, former Blackburn Harrier and Councillor John Wiiliams and his wife). ‘George was a Coach, Referee, Organiser with absolute dedication to the youngsters he brought into the world of sport’ June went on to tell the audience. His work ‘resulted in hundreds of children participating in some sport. 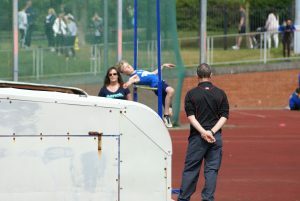 He coached and encouraged some of those students to the go on to the Harriers, steering them through higher competition’. June told the audience that ‘George always had an ambition, a dream, for a super top class Track to be established at Witton Park and over a ten year period, he and others worked tirelessly, alongside the Borough Council for this and in 1958 that dream became a reality’.….going on to host many events including the English Schools Championships, Open Meetings with international and Olympic athletes all competing in Witton Park. 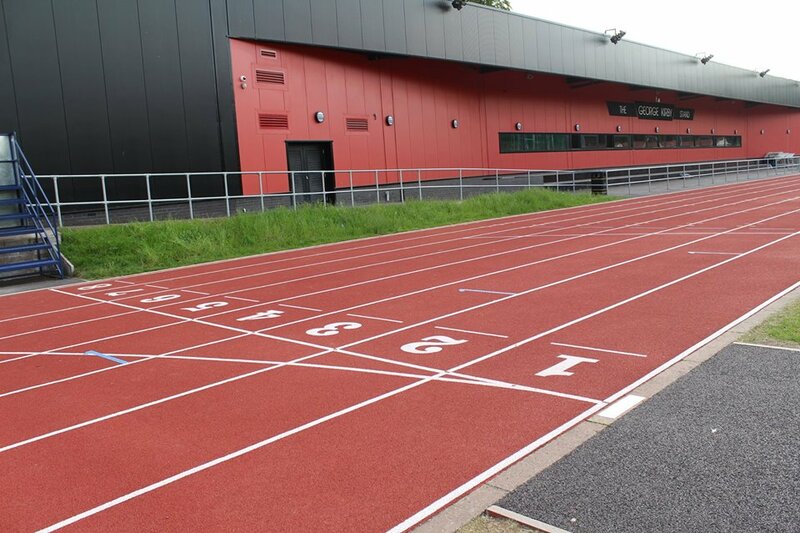 The work that George laid down, working alongside the Council lives on and is evidenced by the new facility which has been built recently at Witton Park, including a Community Gym, an Indoor Training Track, a new outdoor track, new floodlighting and a Stand – appropriately named after the man himself – The George Kirby Stand. 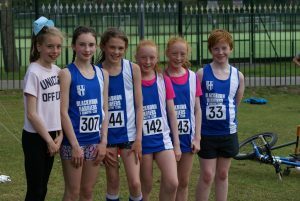 The partnership between Blackburn Harriers and Blackburn with Darwen Borough Council remains as strong as it ever was. The night wasn’t over for the Harriers though as Hammer Thrower Jacob Roberts was Awarded both the Young Achiever of the Year Award and the International Award in recognition fo his achievements over the previous twelve months.